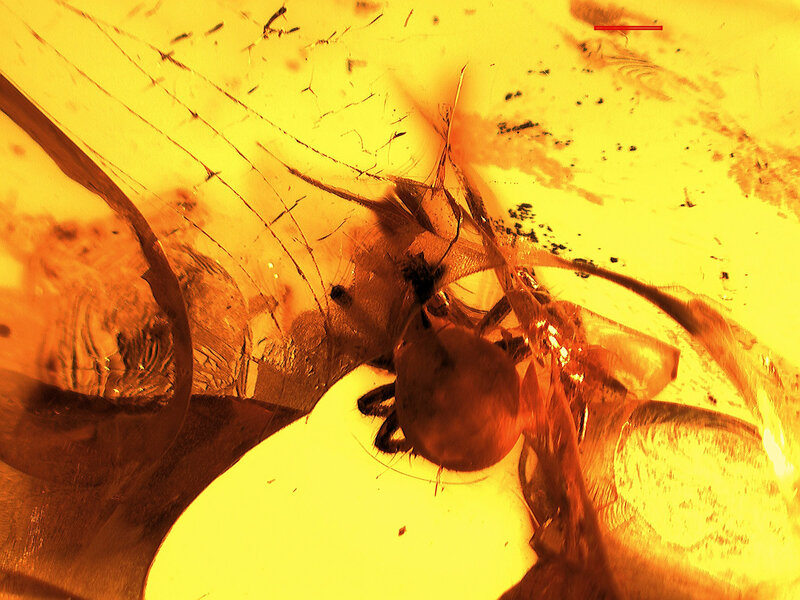 This page is different from the other pages. 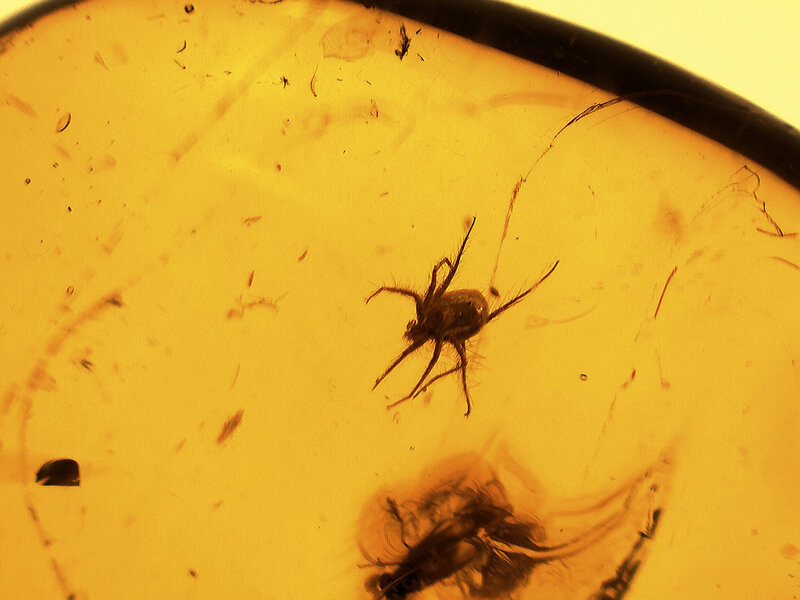 This has only Baltic amber with spiders. 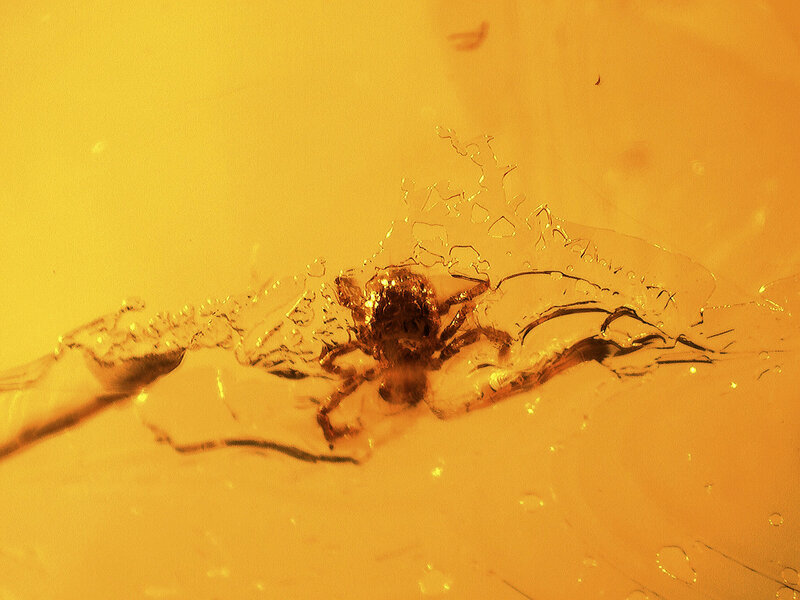 Sometimes there are other animals, but all pieces have at least one spider in them. 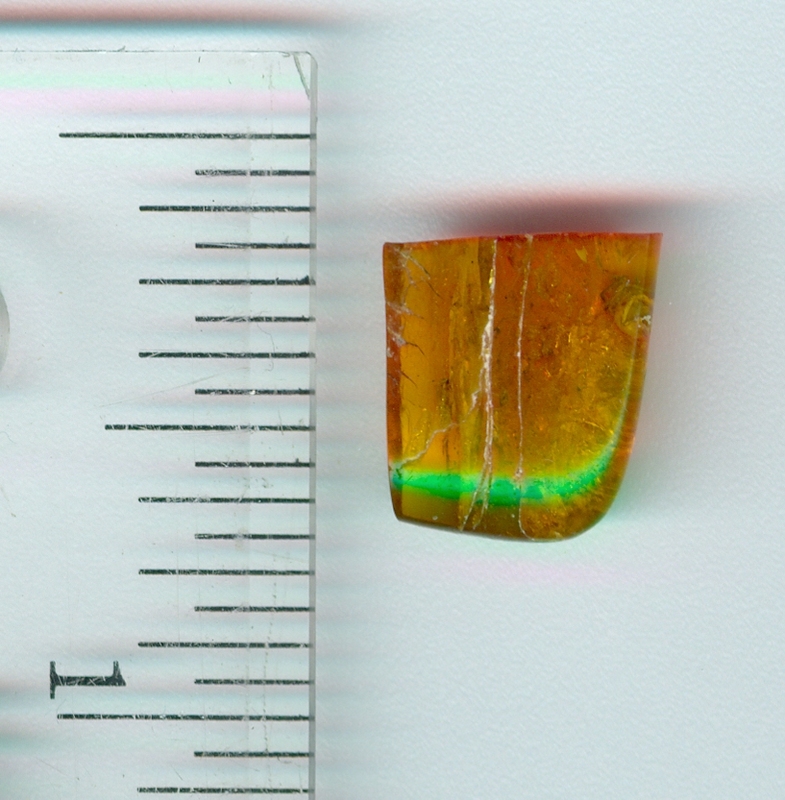 Rather nice sized piece of Baltic amber with a few rough corners (gives it distinction). 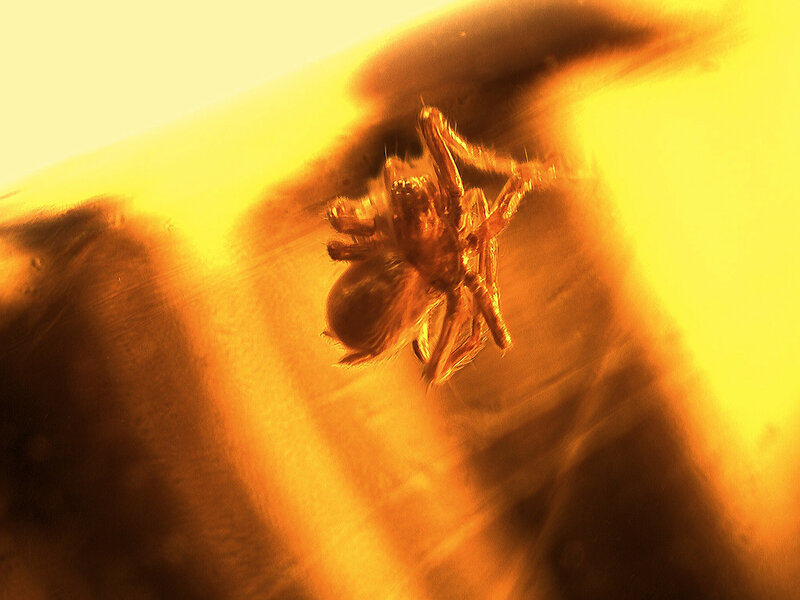 Spider is small, but visible. 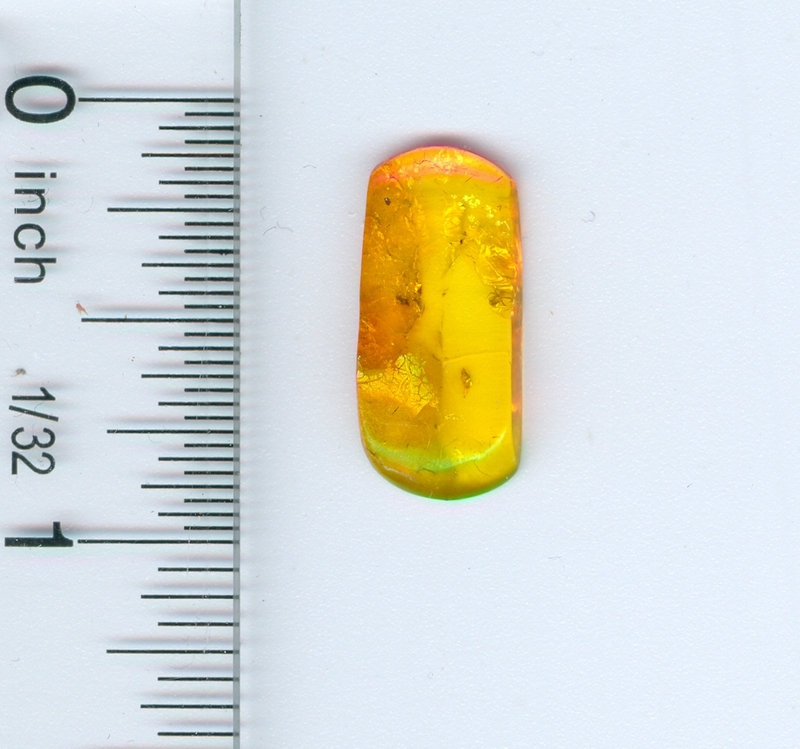 This is a small piece of Baltic amber. 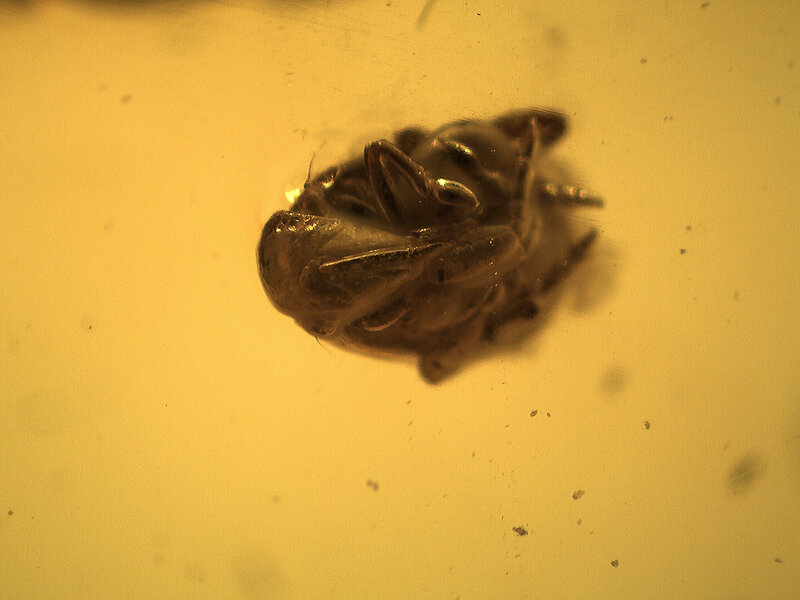 Inside it is a 1st instar mite. 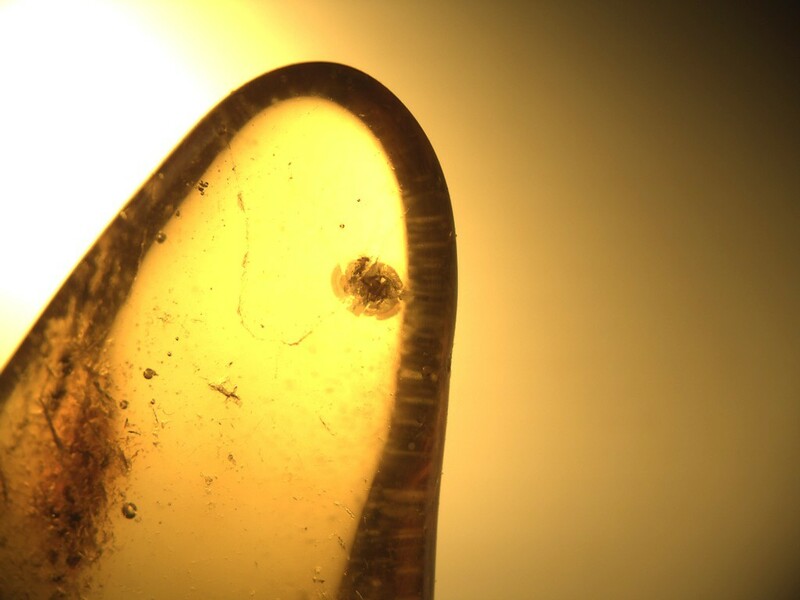 If you are into mites, this is a nice piece at a good price. 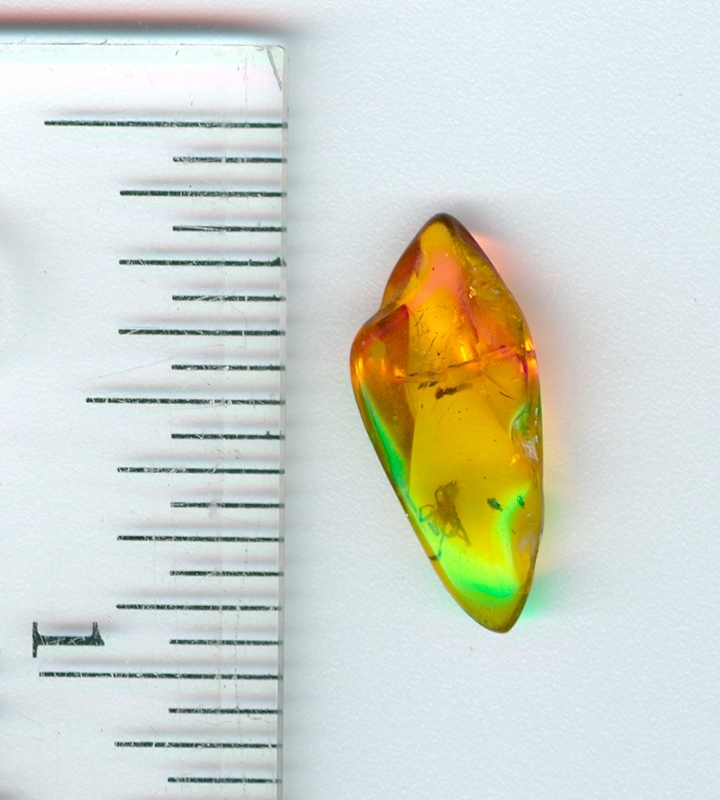 The casual collector may not be interested because of the size. 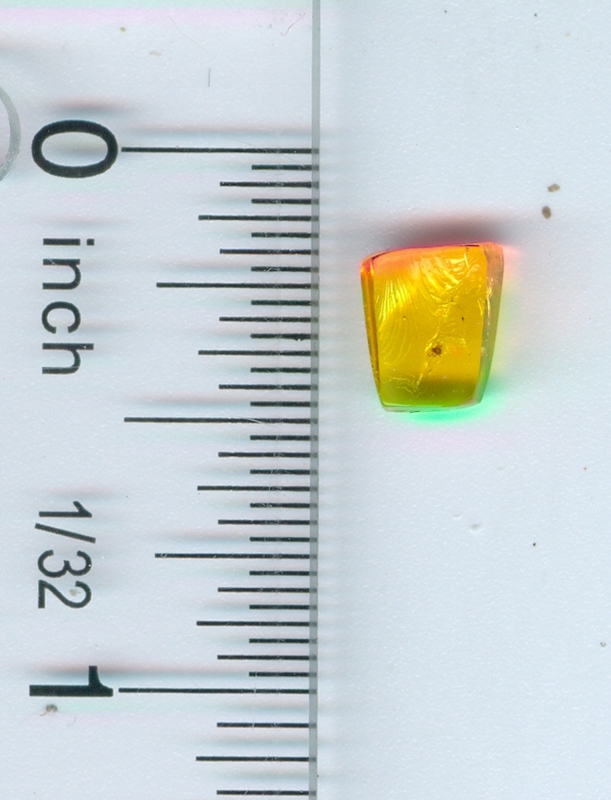 Smallish, triangular piece with a spider at one end. 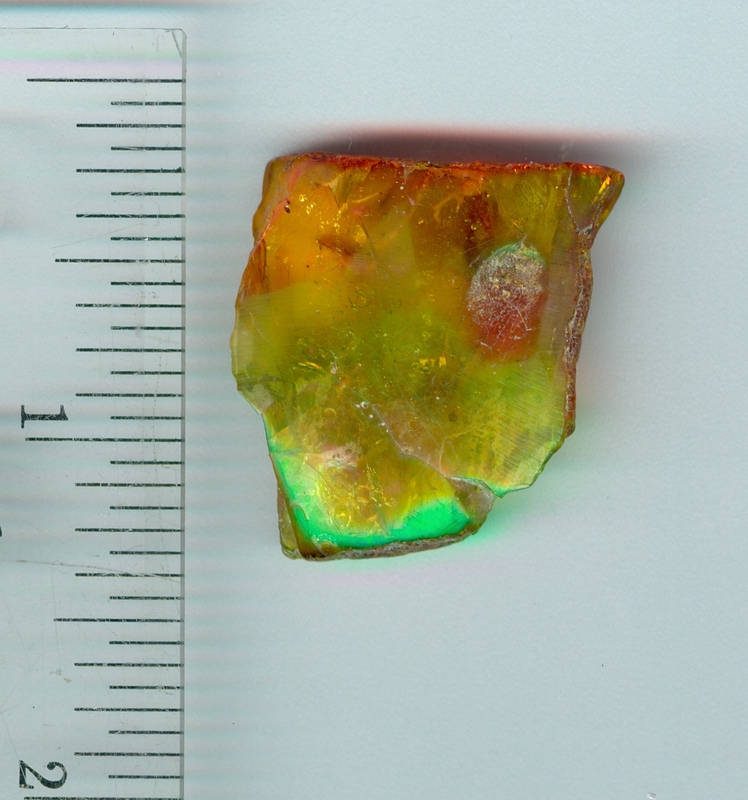 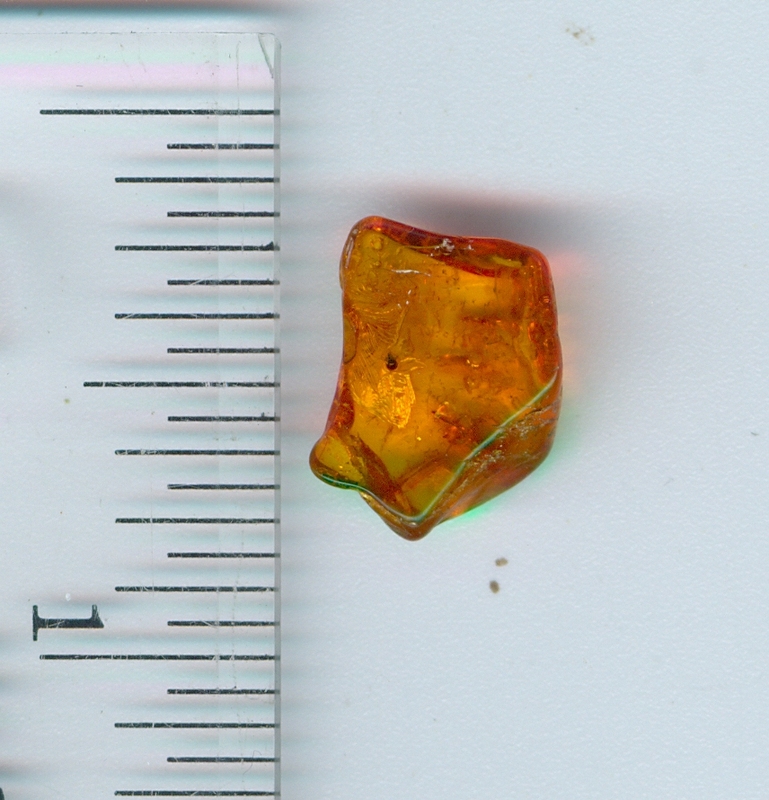 Similar to the piece above (smallish) with an irregular shape, there is a nice small spider on one side. 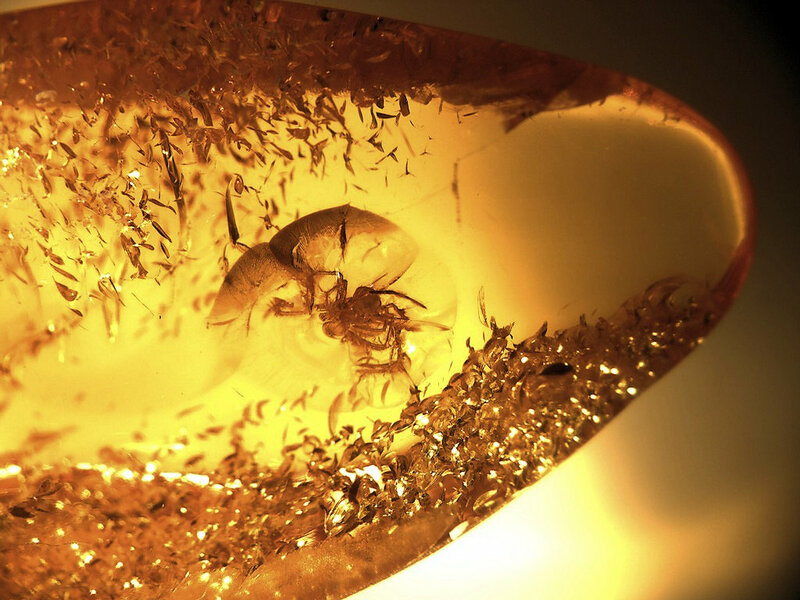 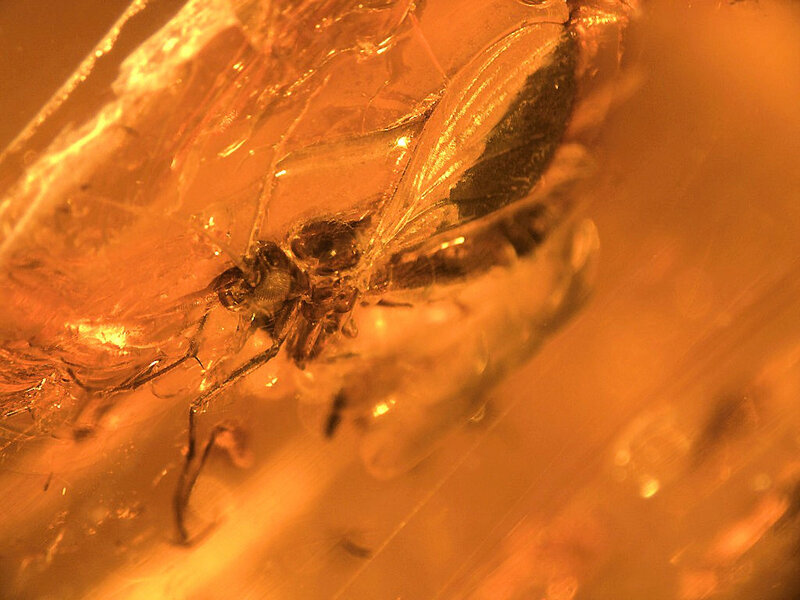 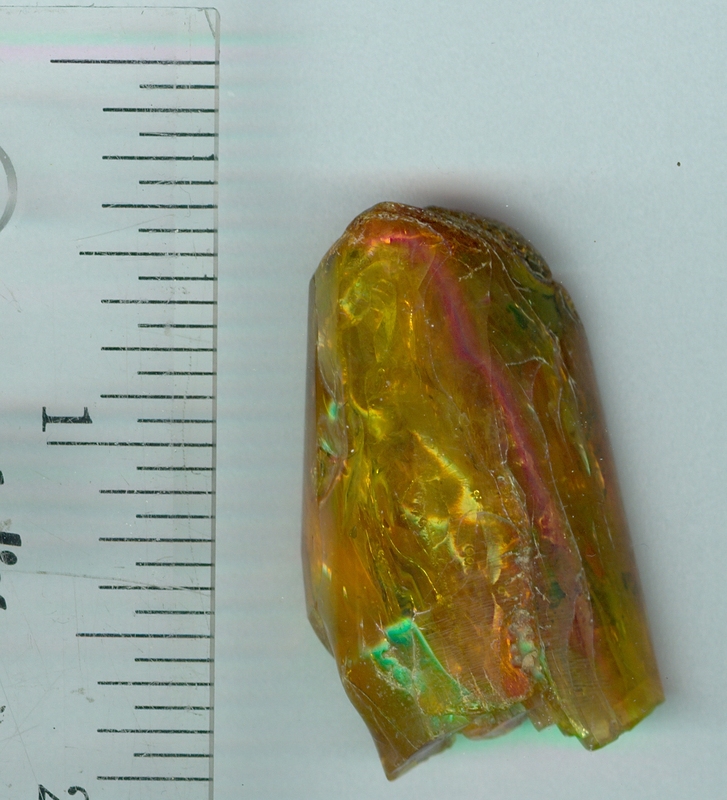 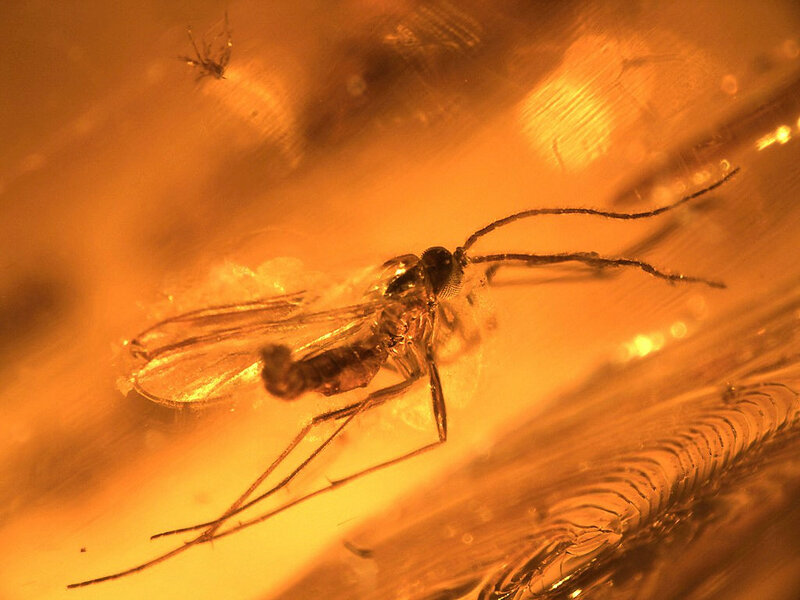 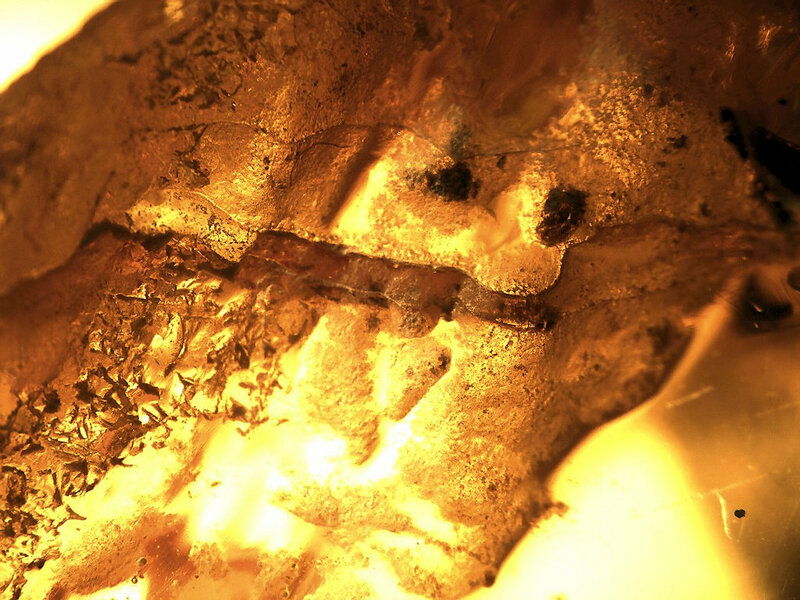 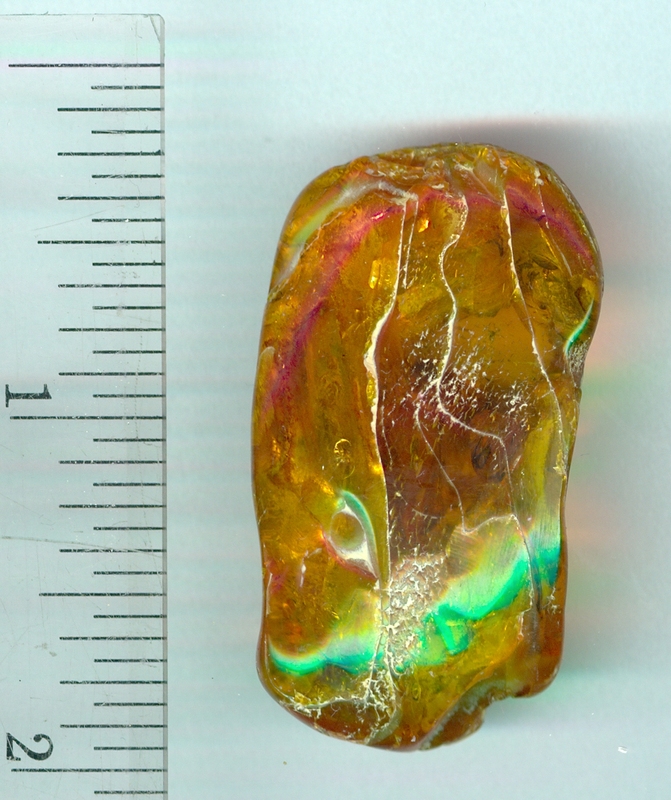 A large piece of amber with a whole zoo inside. 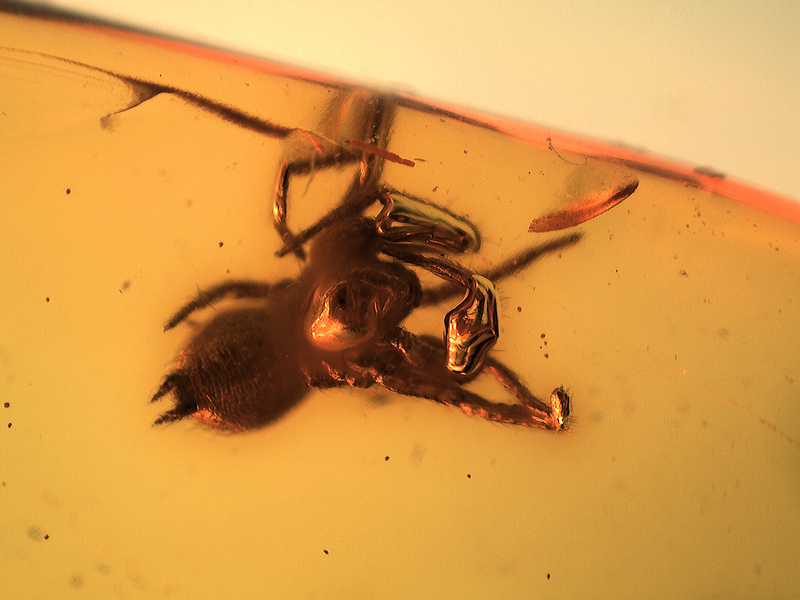 There is a spider, Oonopidae, not big, but she is there. 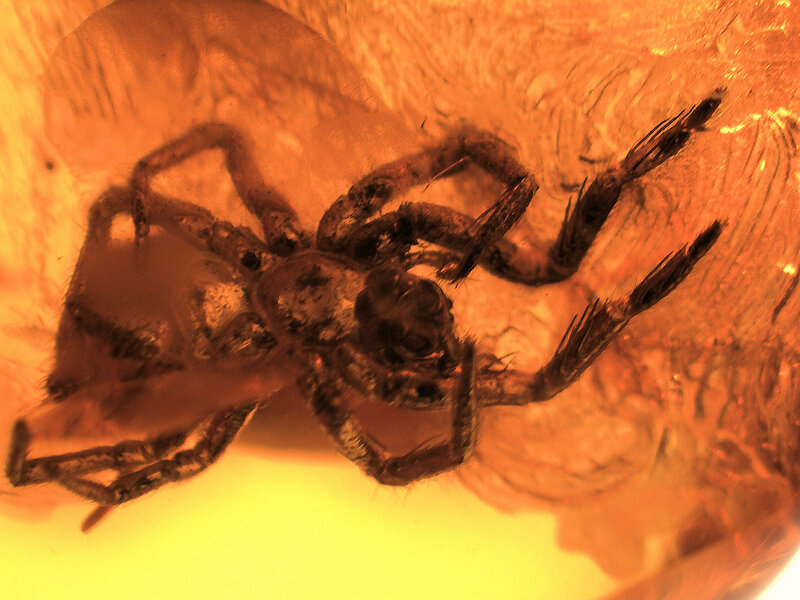 There is another spider, Segestriidae (tube-dwelling spider). 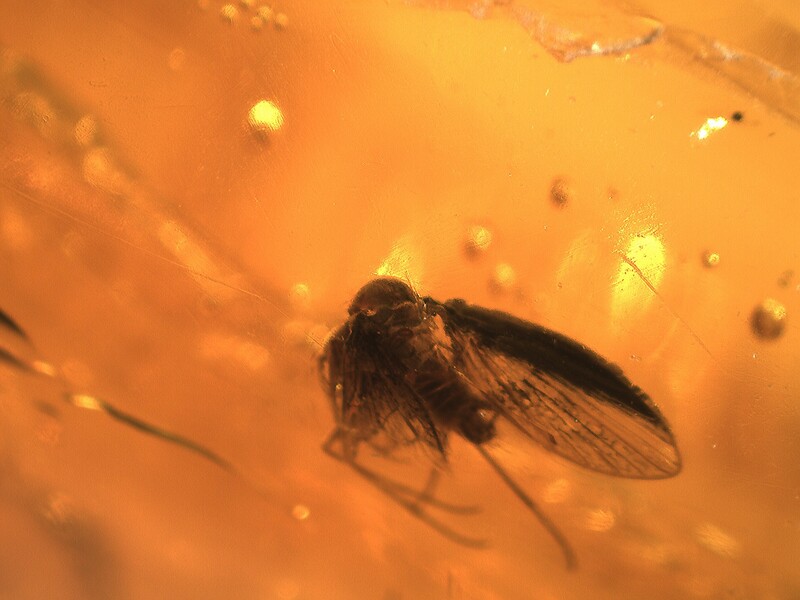 Lots of Dipterans, I am not going to even try and ID them. 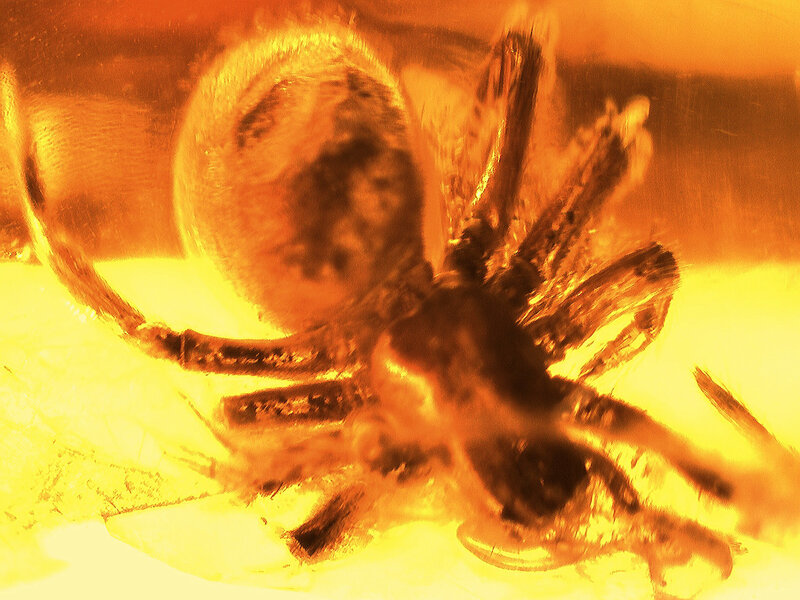 At least 6 of them. 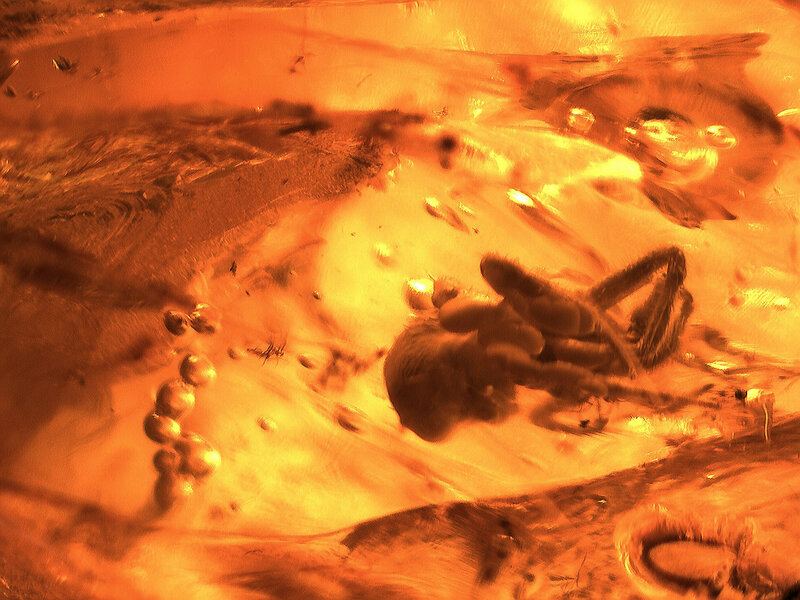 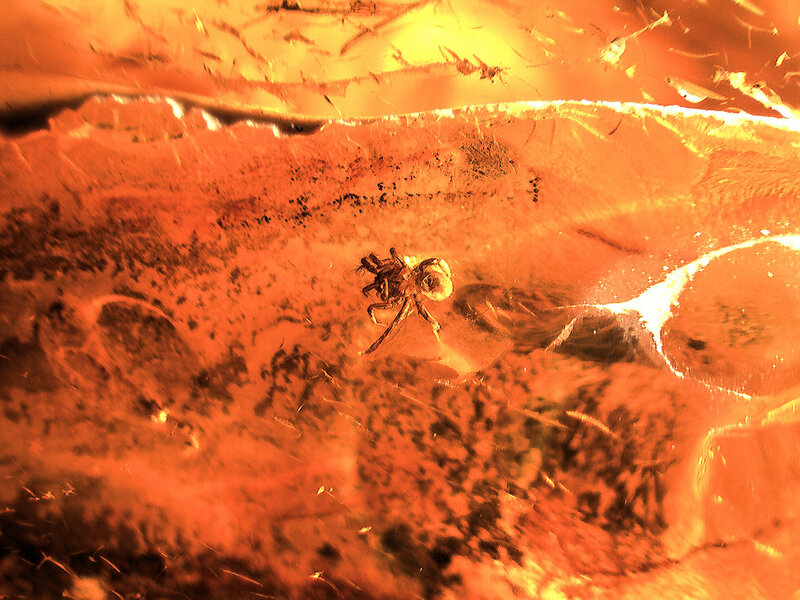 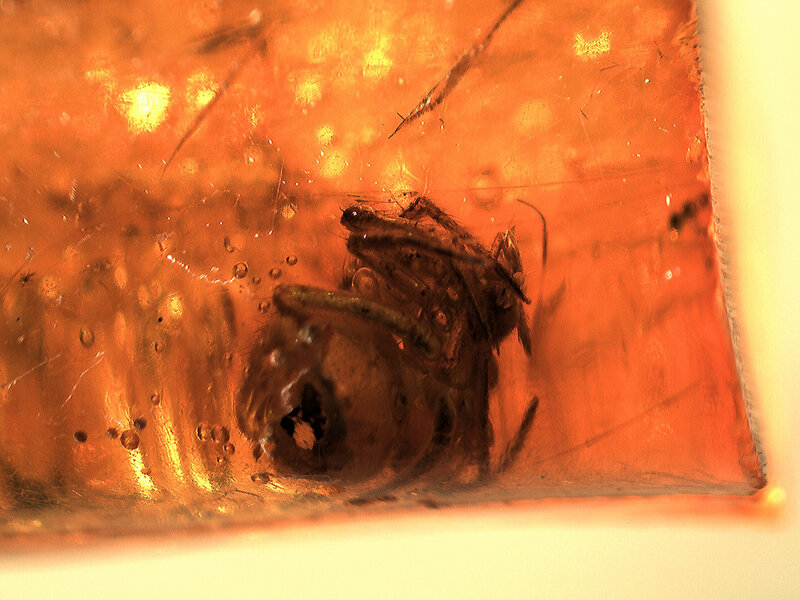 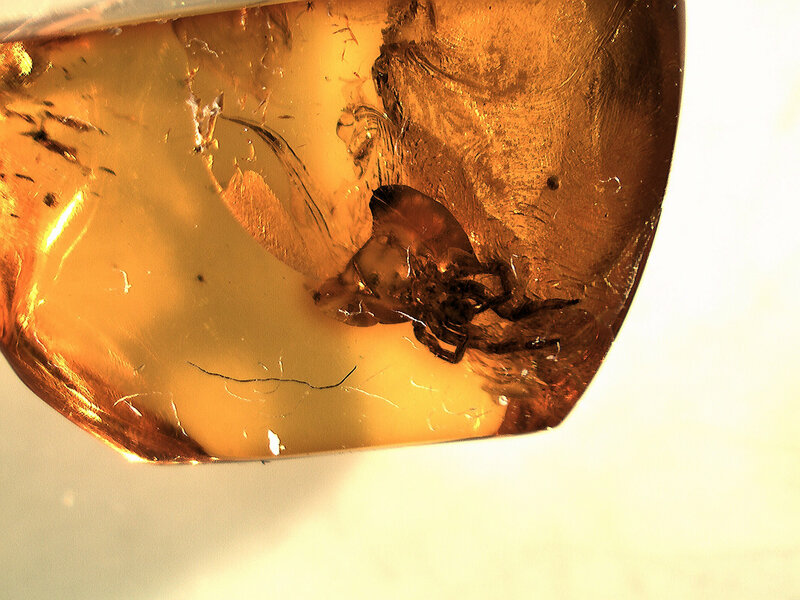 Fascinating looking spider in a nice piece of amber. 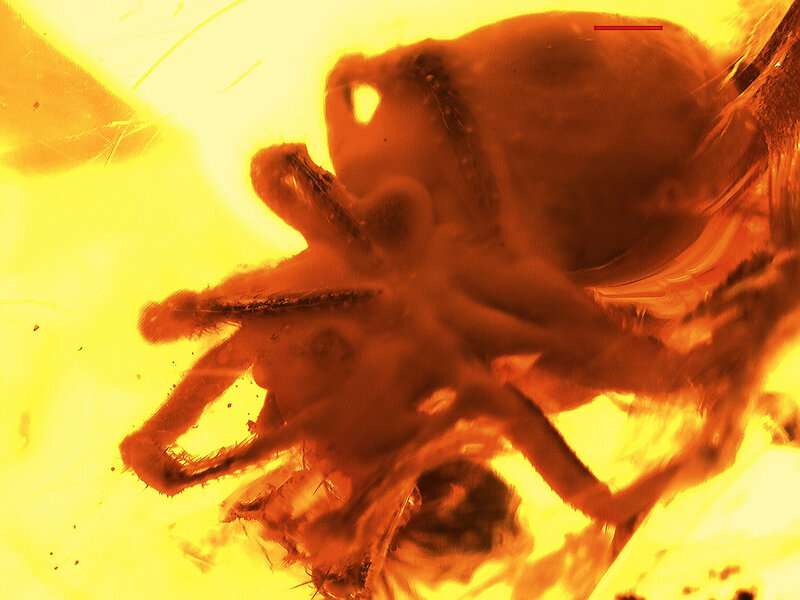 The abdomen is perfectly round. 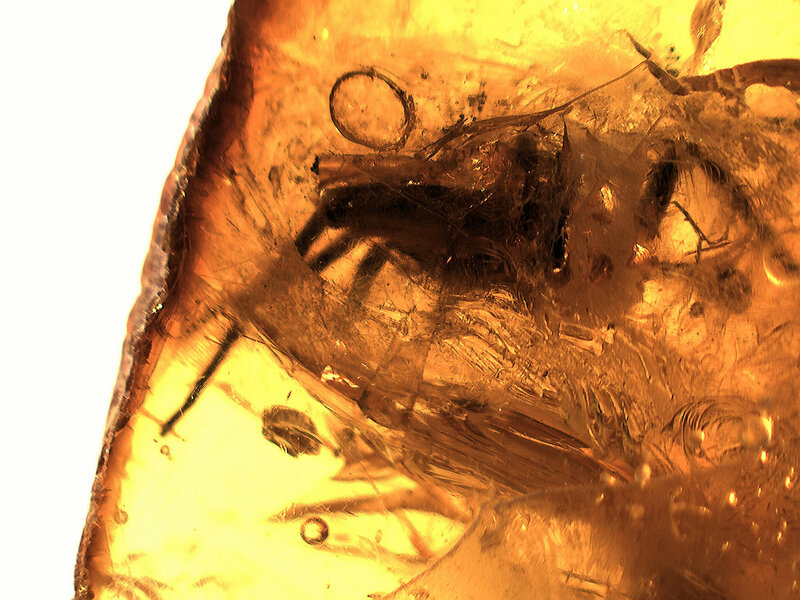 There is a small springtail in this piece. 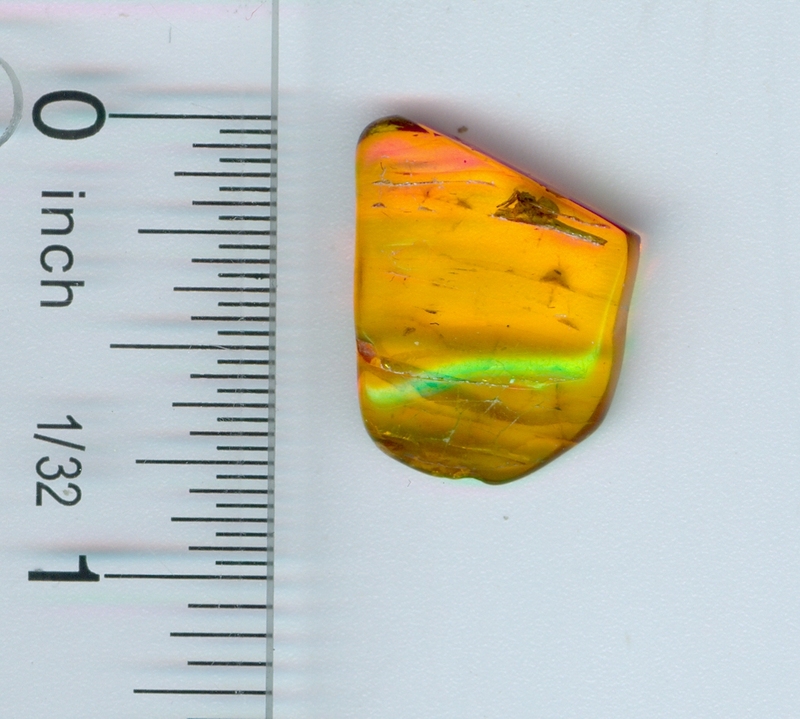 Thin"ish" with rough edges on the short sides, but nicely polished none-the-less. 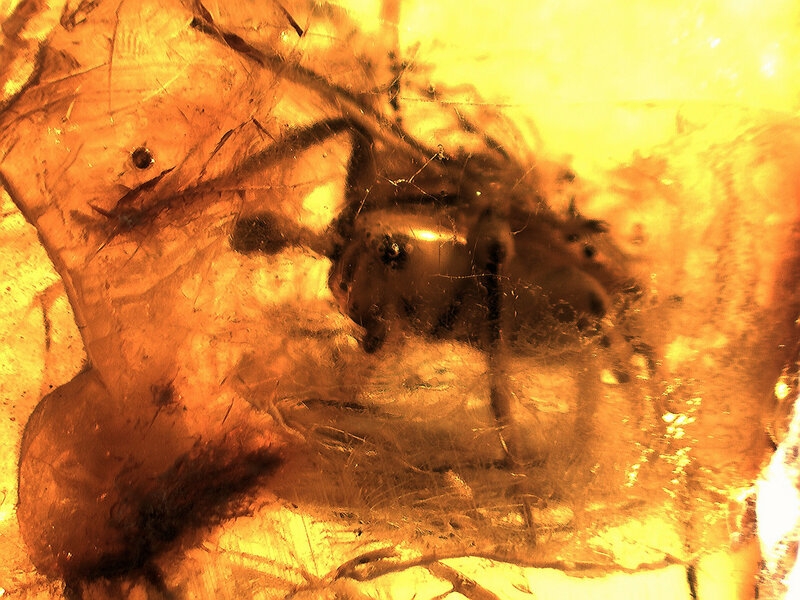 There is an obscured spider along with numerous other Dipterans. 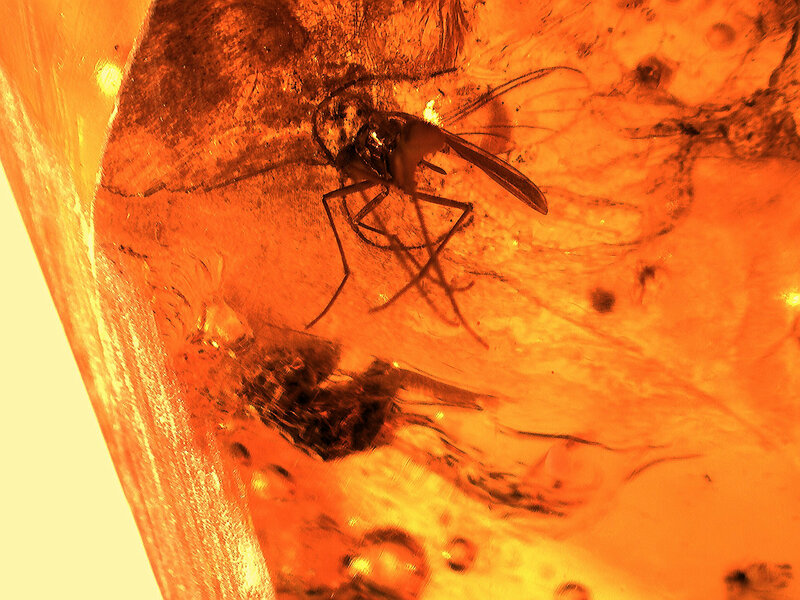 A dark winged fungus gnat, Scaridae along with 2 midges and two other unknowns. 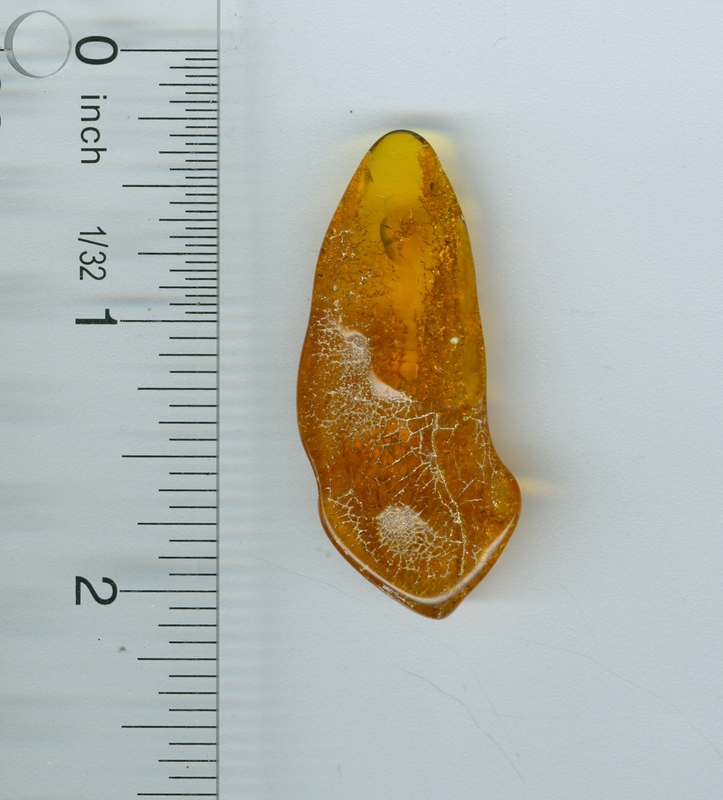 Nice piece of amber, I like the shape. 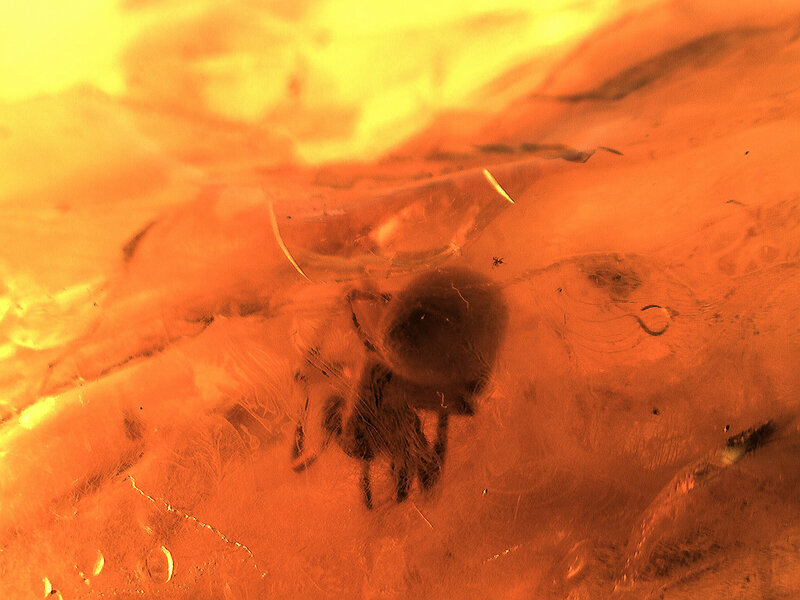 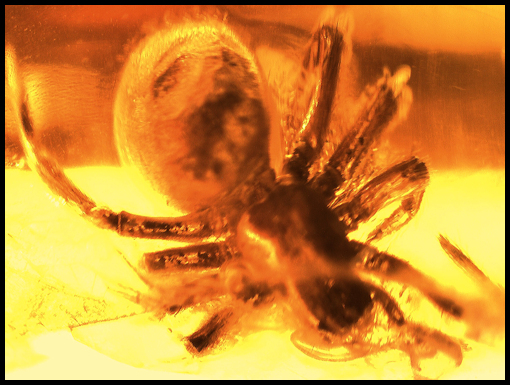 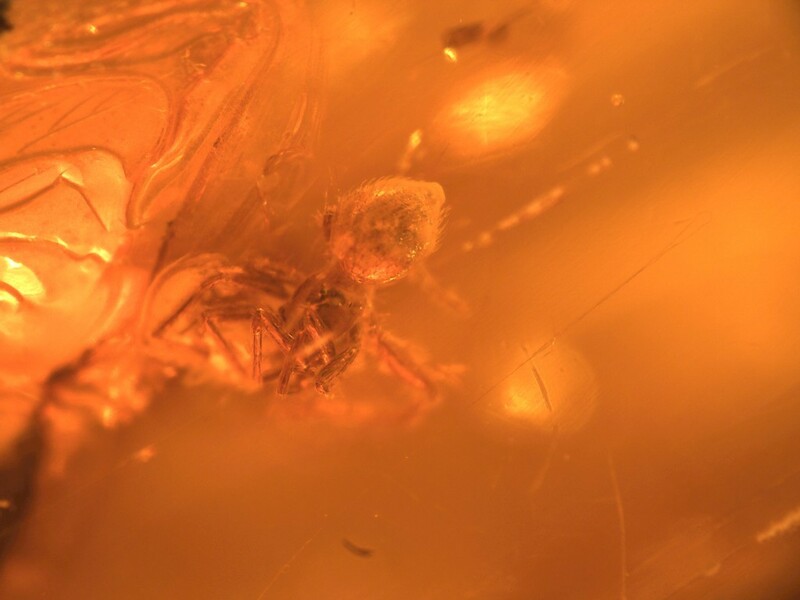 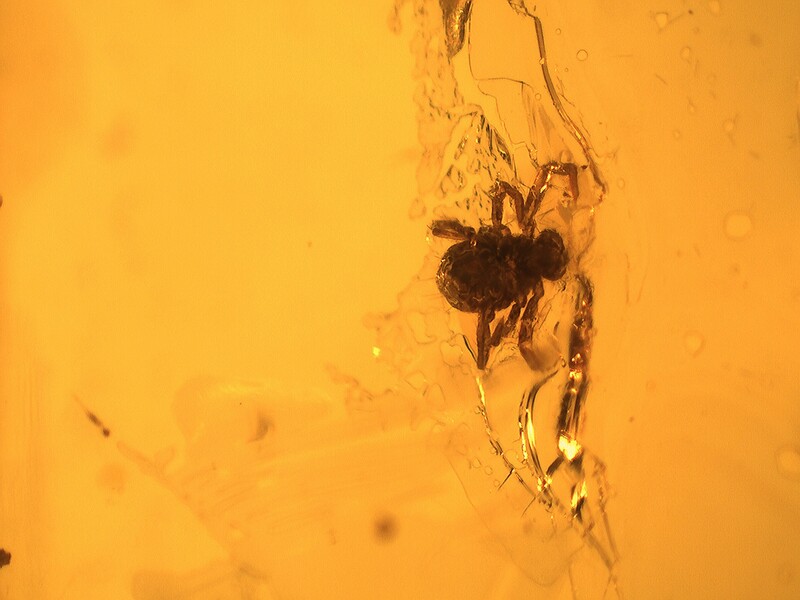 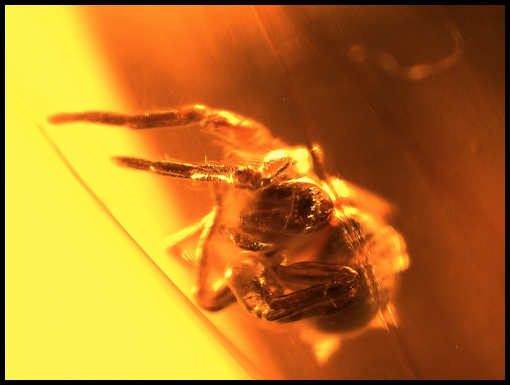 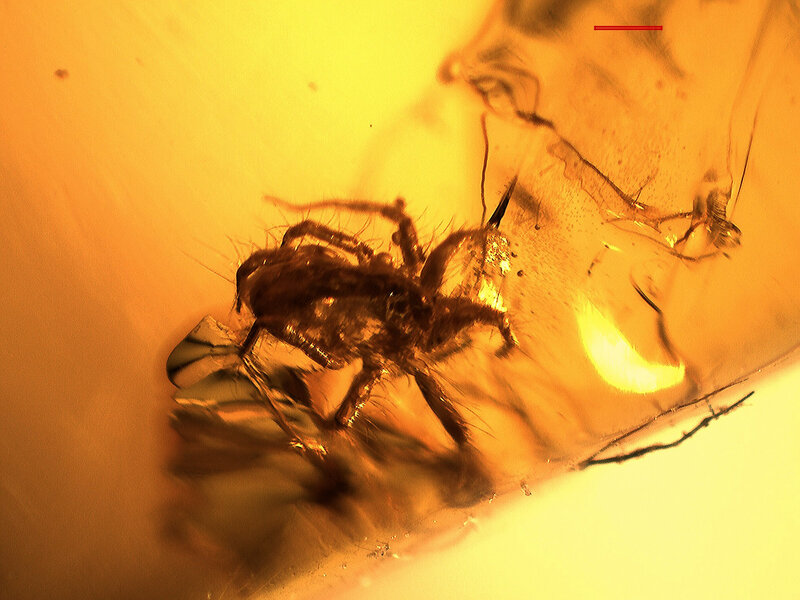 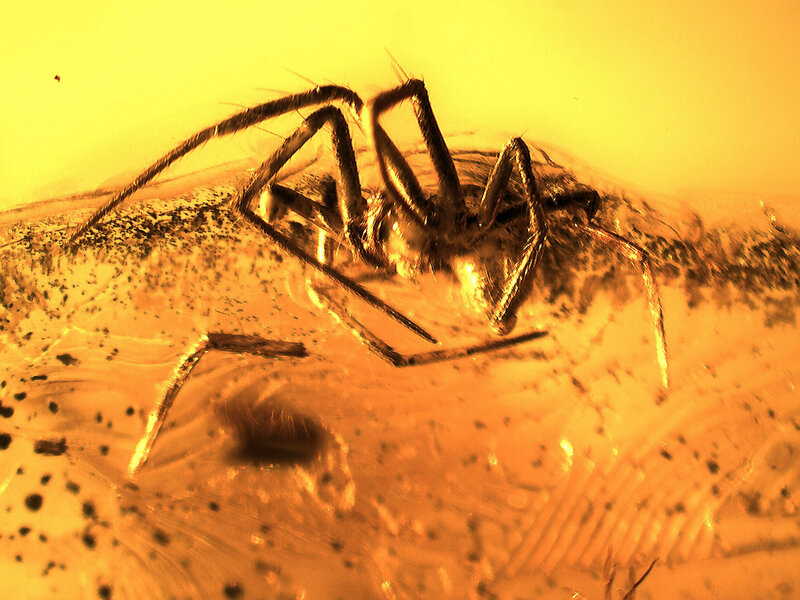 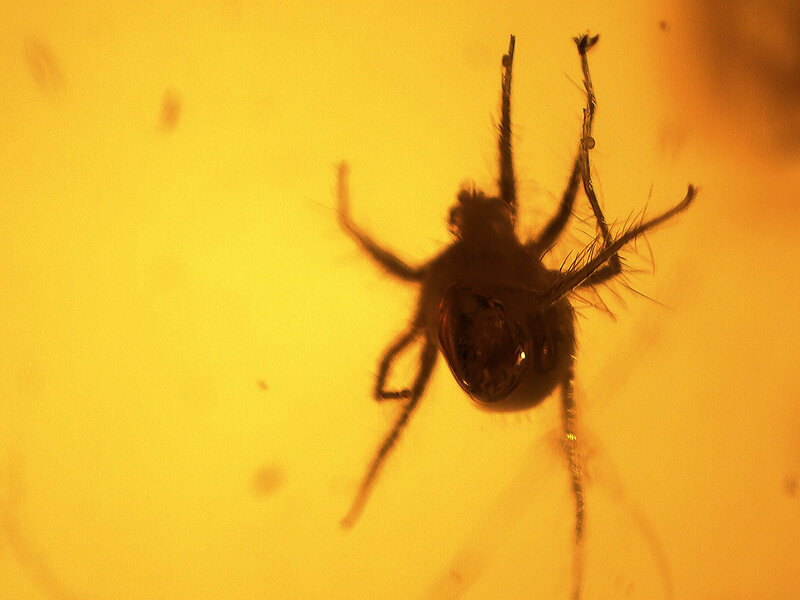 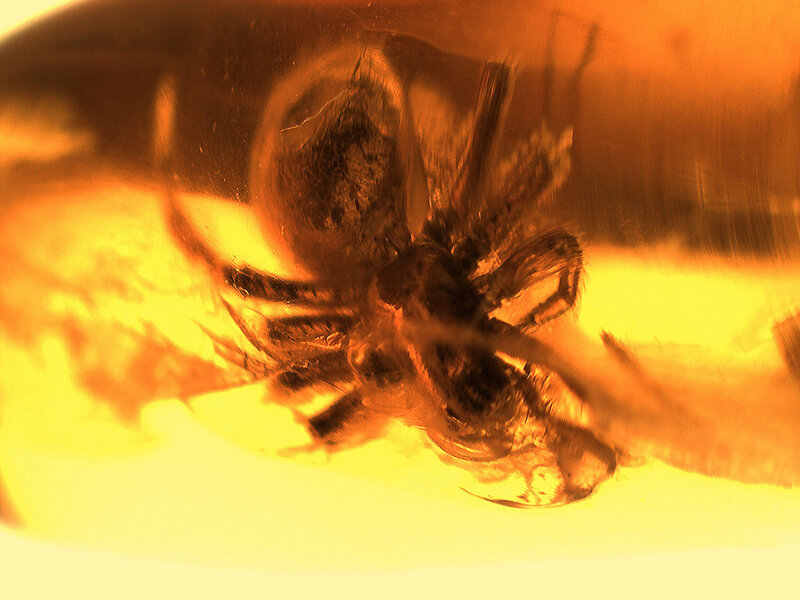 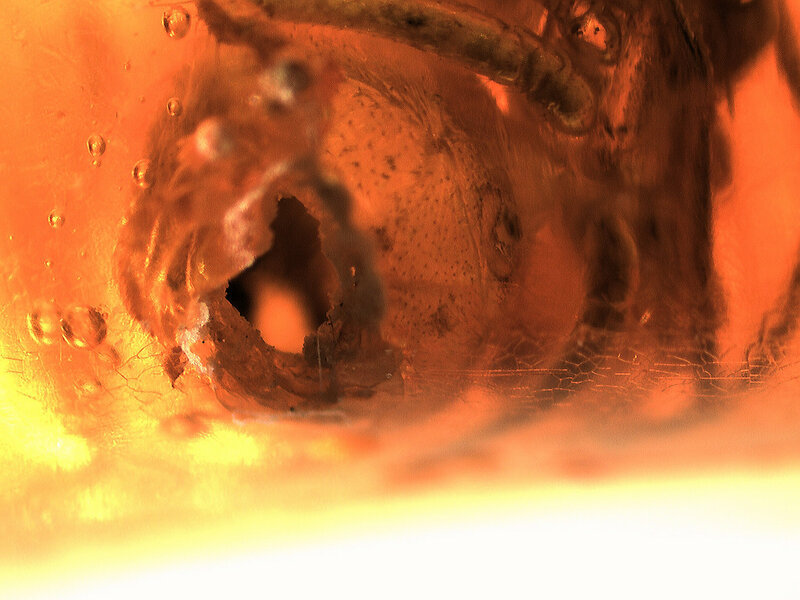 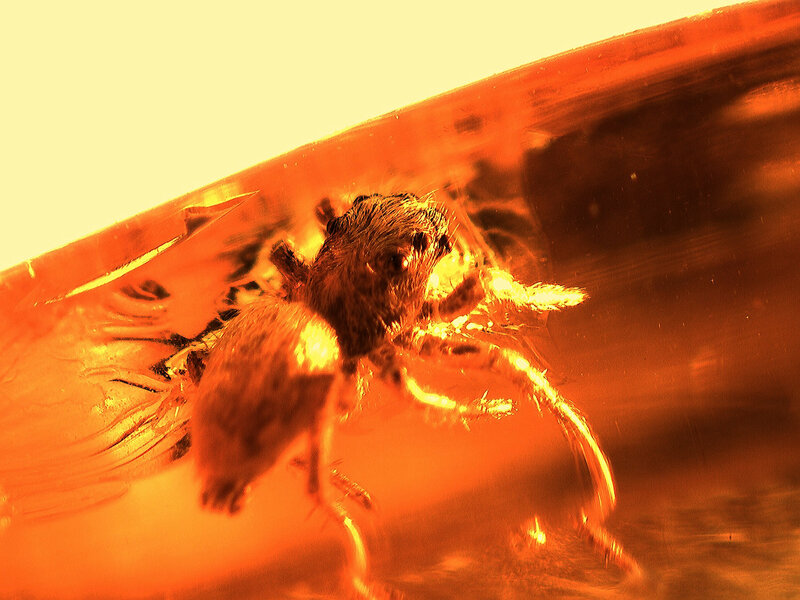 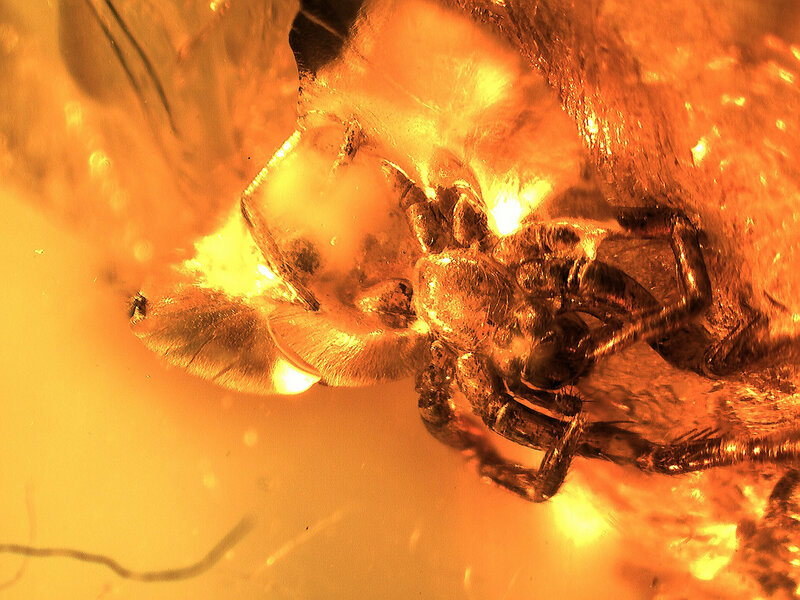 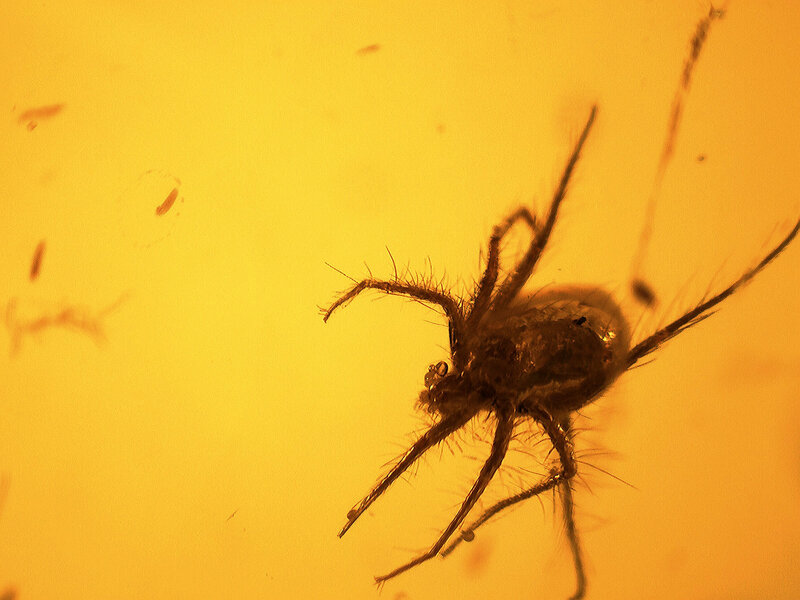 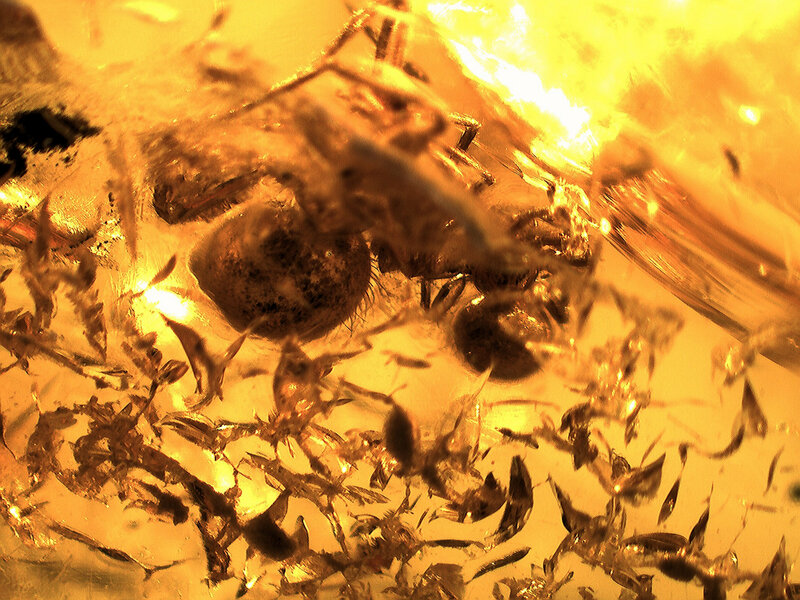 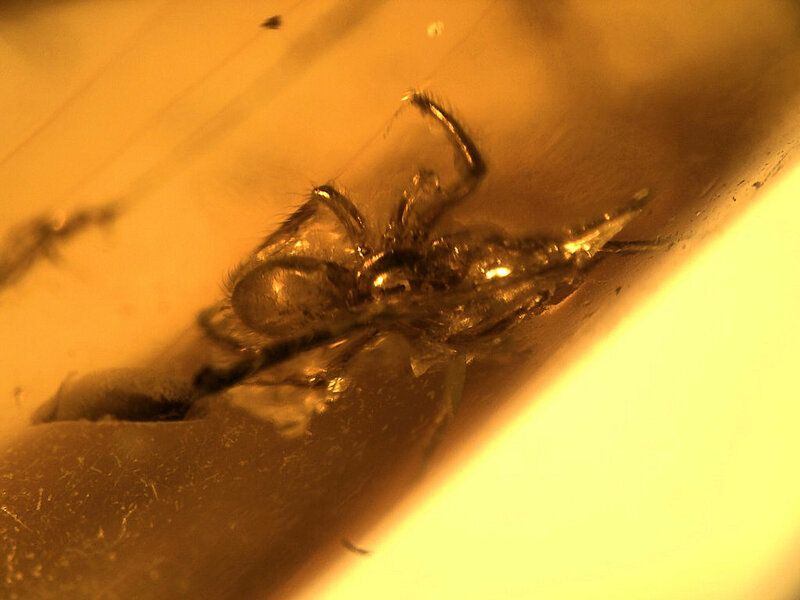 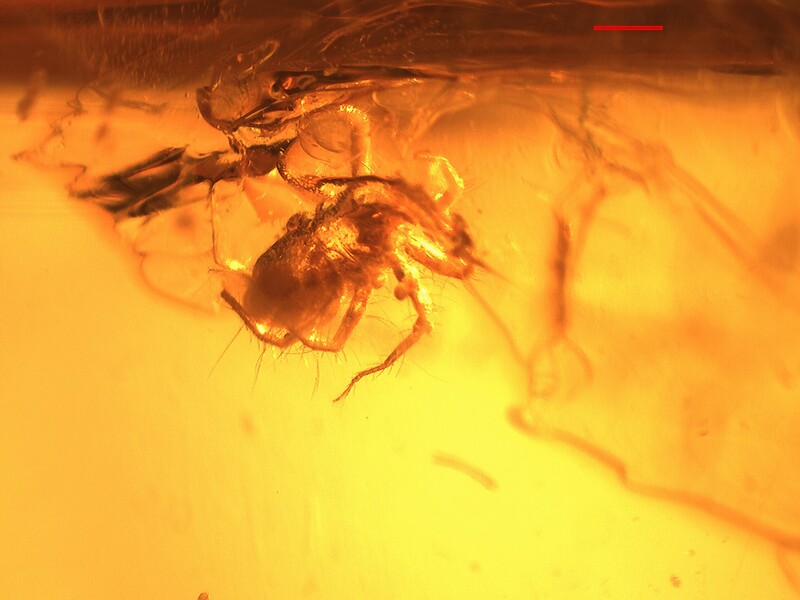 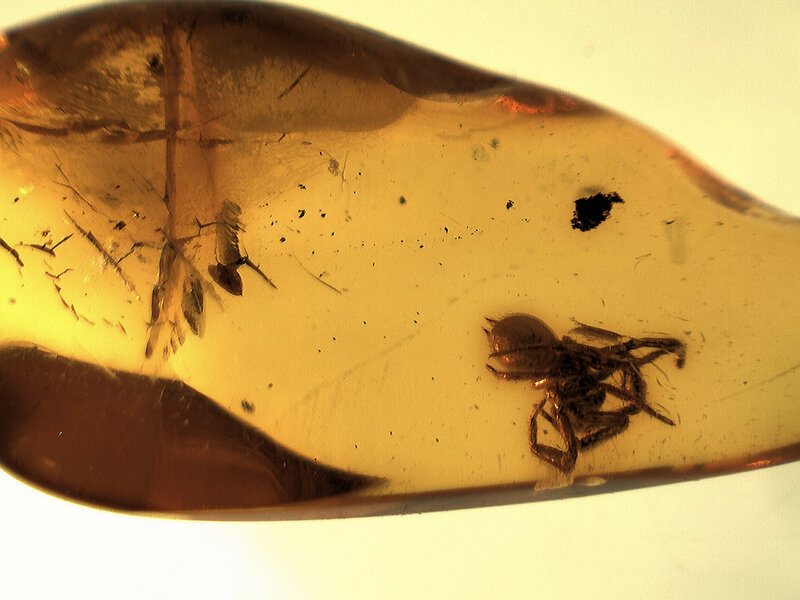 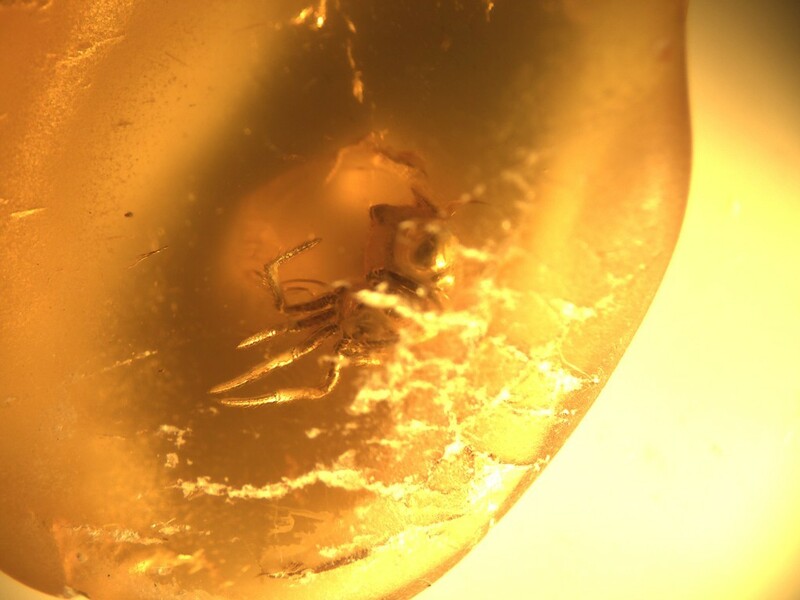 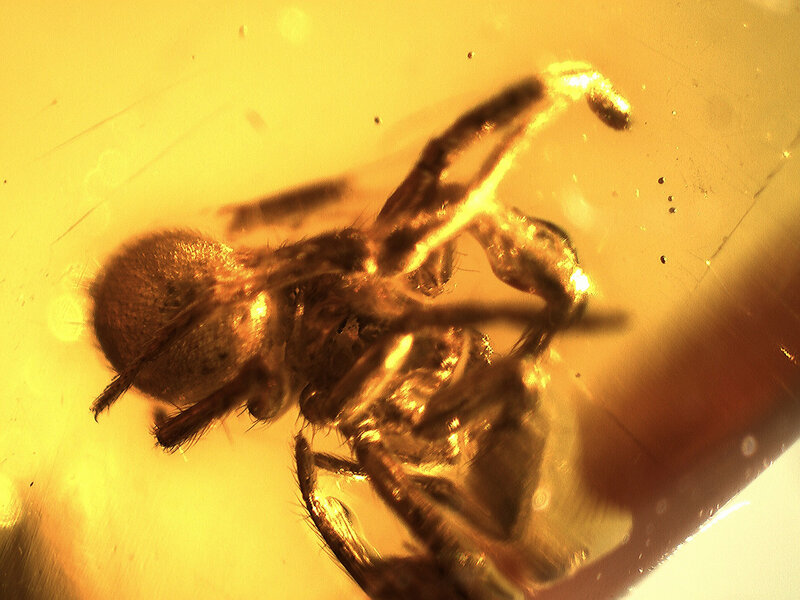 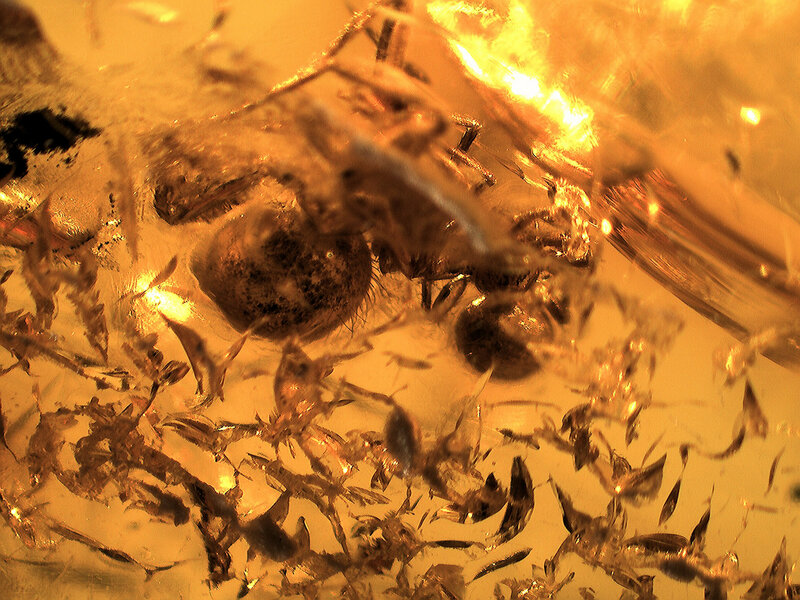 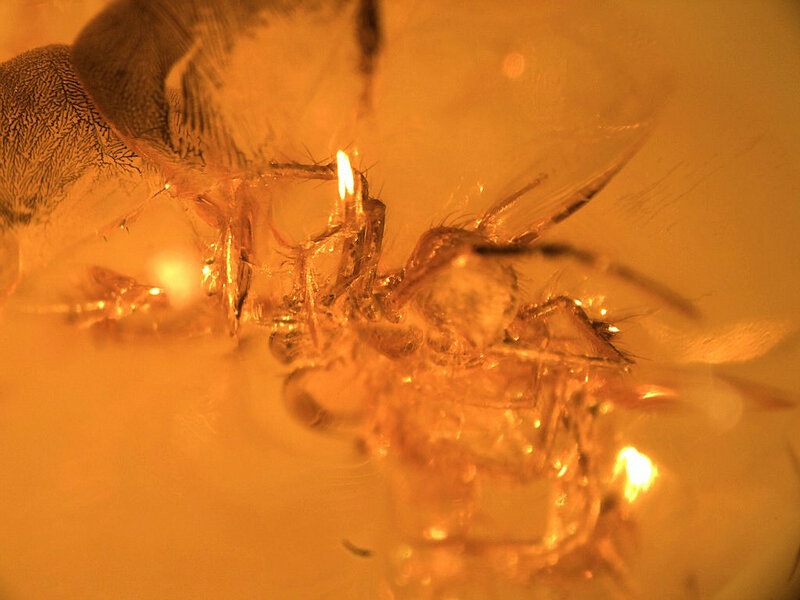 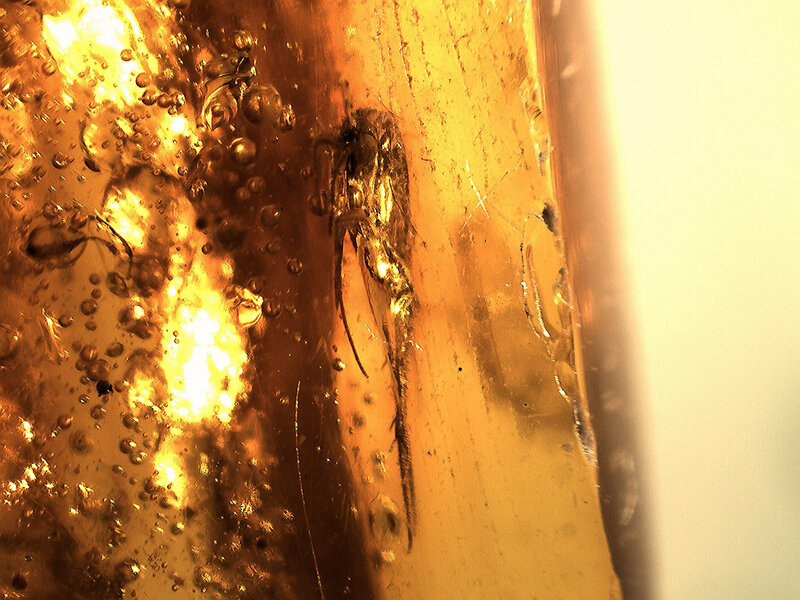 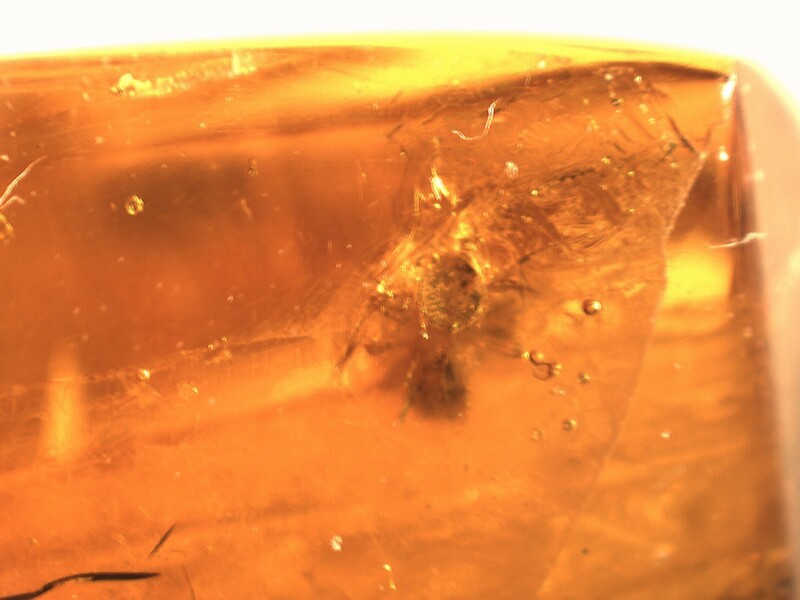 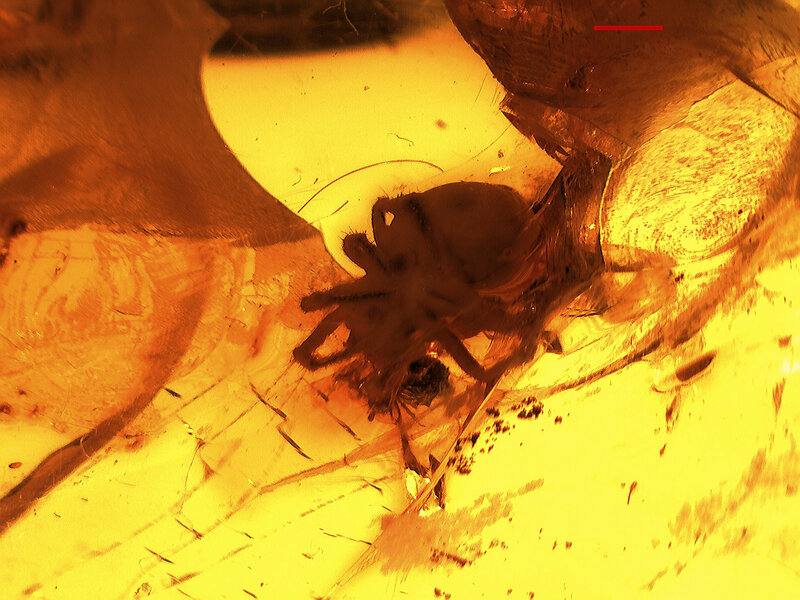 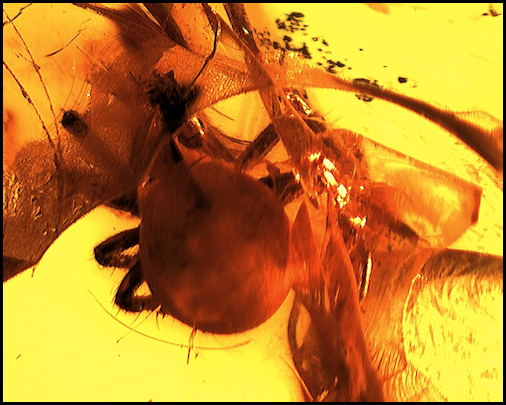 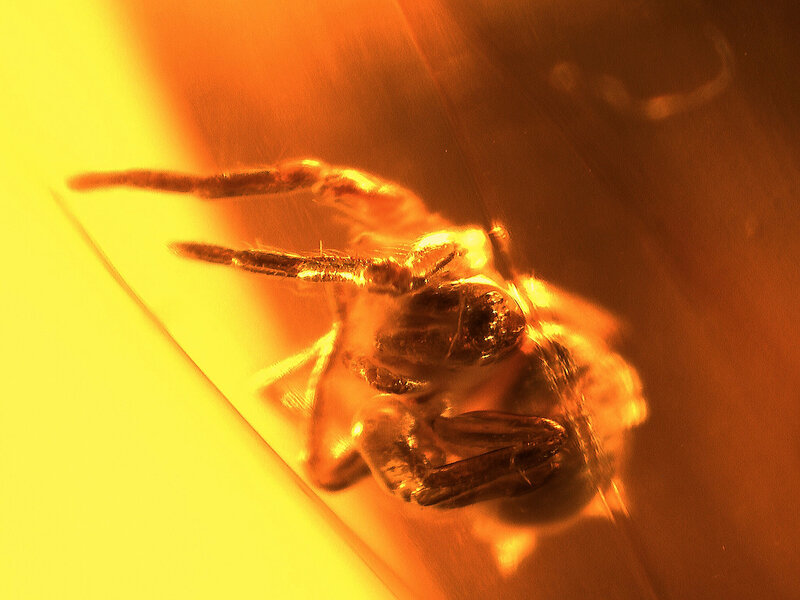 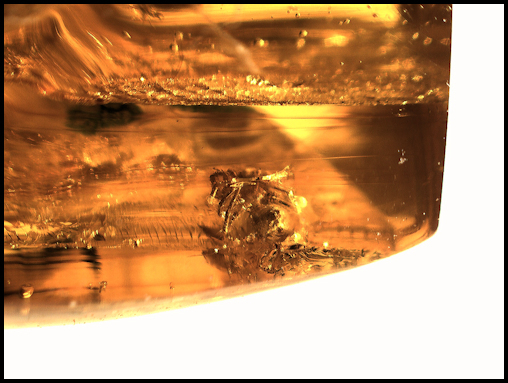 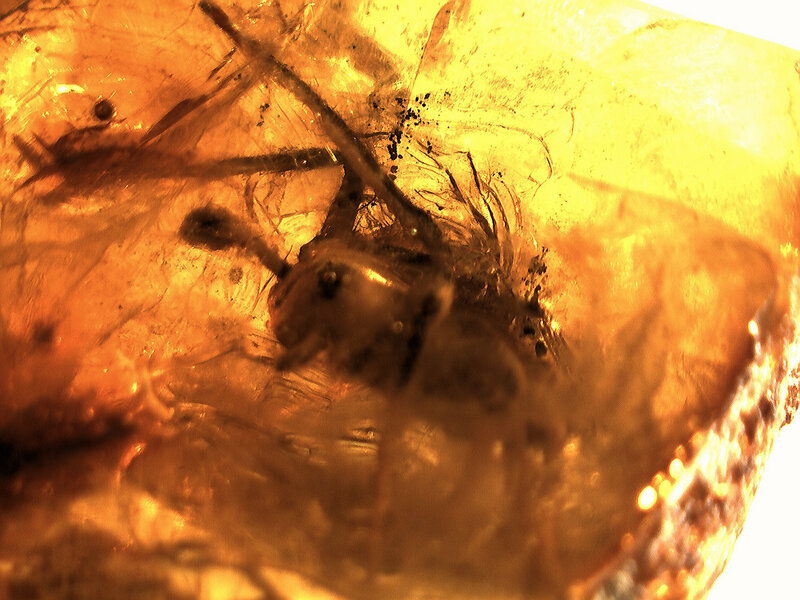 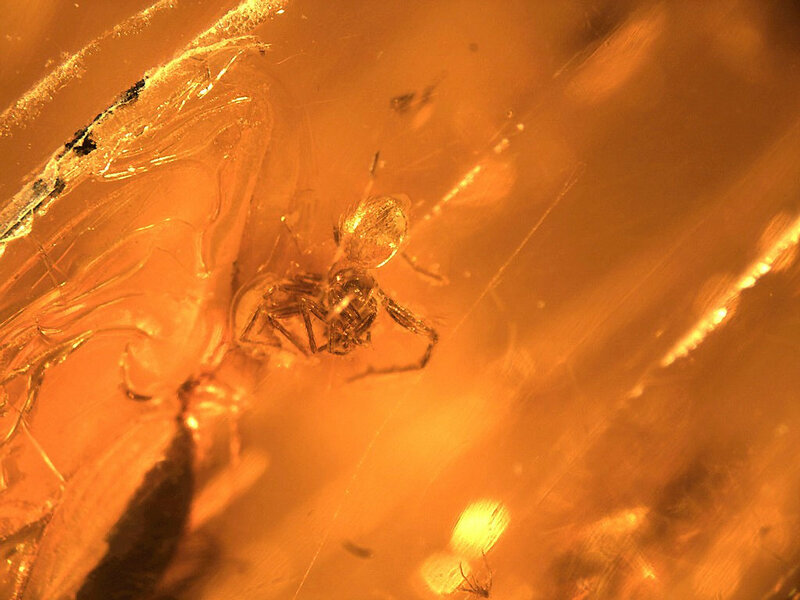 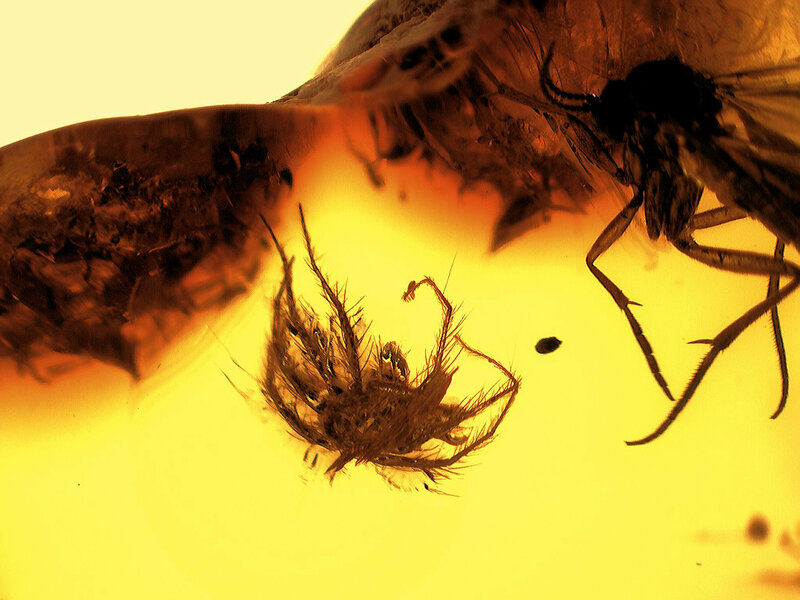 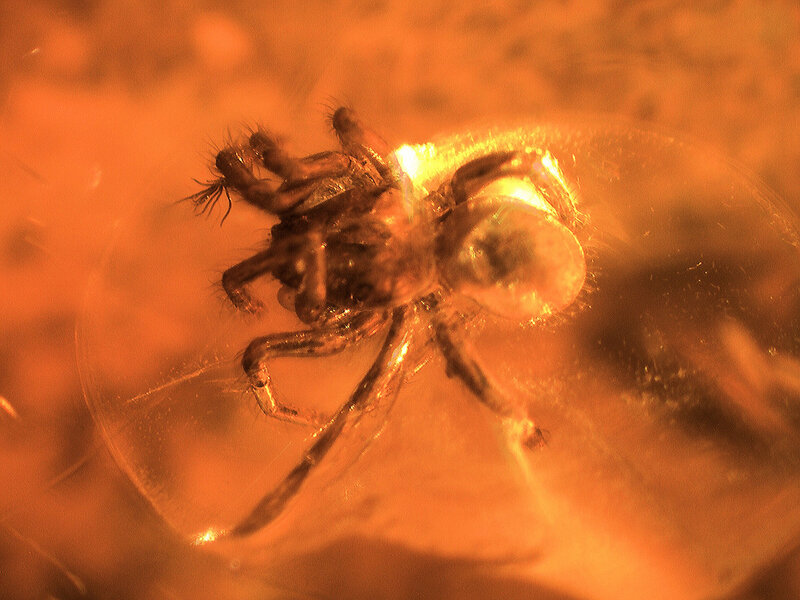 The spider is at the end of the amber, small and hard to see. 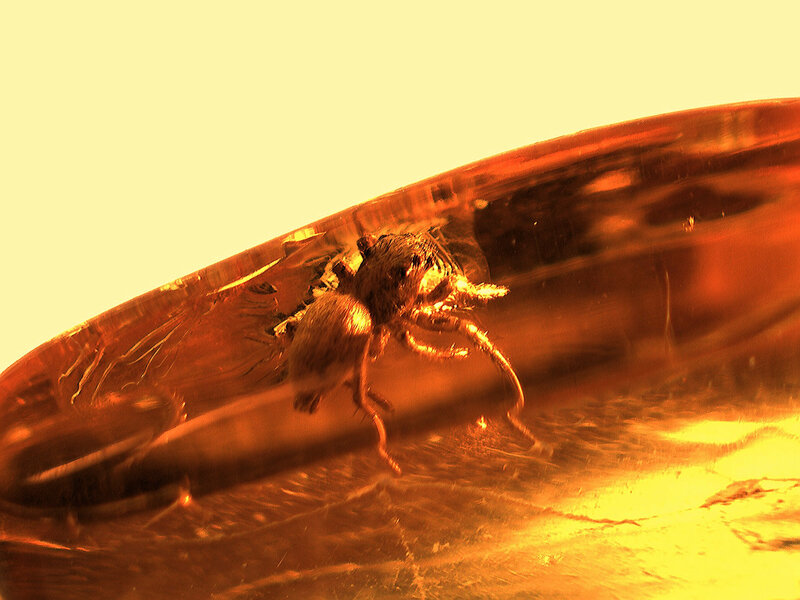 Nicely polished piece, small spider, but visible. This spider is in the Salticidae family. 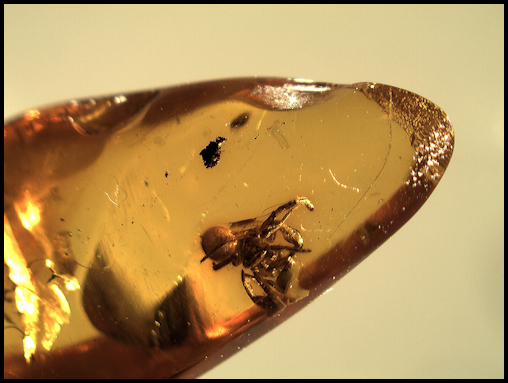 Nice sized piece with a spider and a small coleopteran. 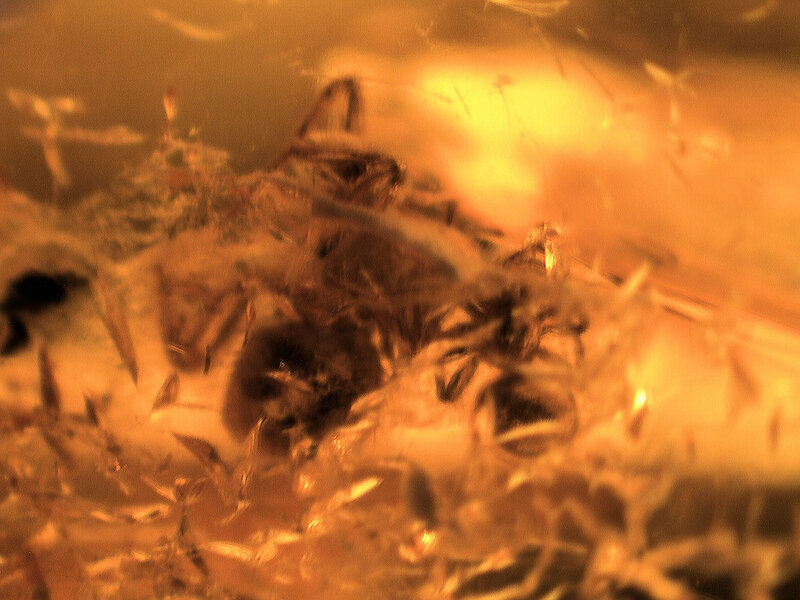 There is also a springtail (small) somewhere in here, but I cannot find it right now. Parasitidae is a family of predatory mites in the order Mesostigmata. 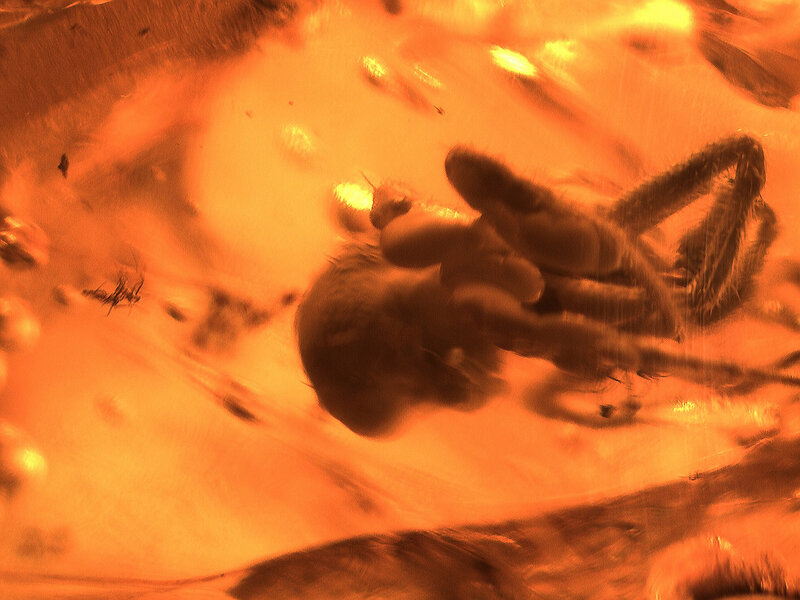 They are the only family in the superfamily Parasitoidea. 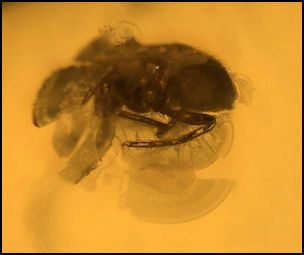 Relatively large for mites, their color is often yellowish to dark brown. 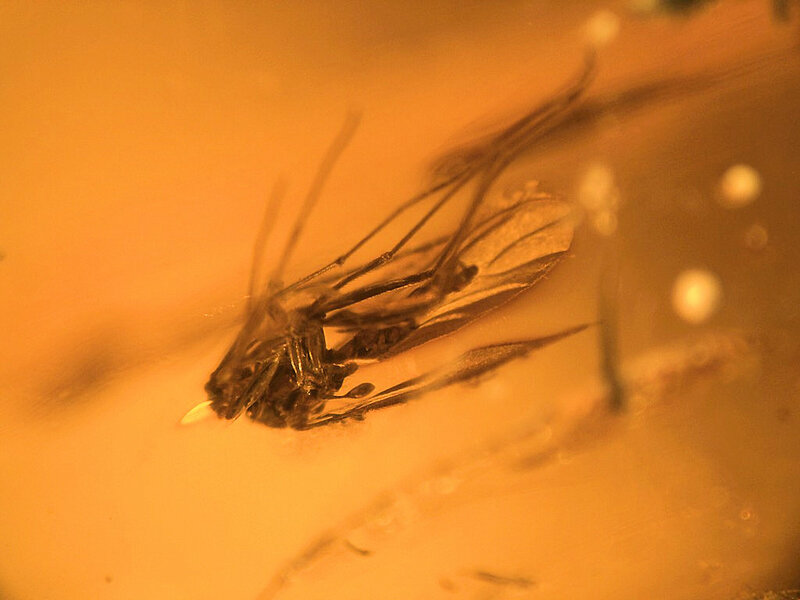 There is also a very nice dark winged fungus gnat, Diptera, Sciaridae. 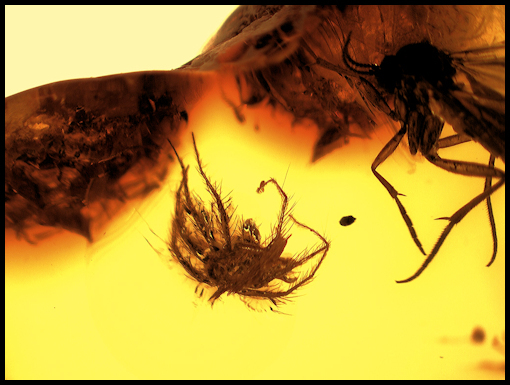 Here is a flat piece that has "the spider and the fly". 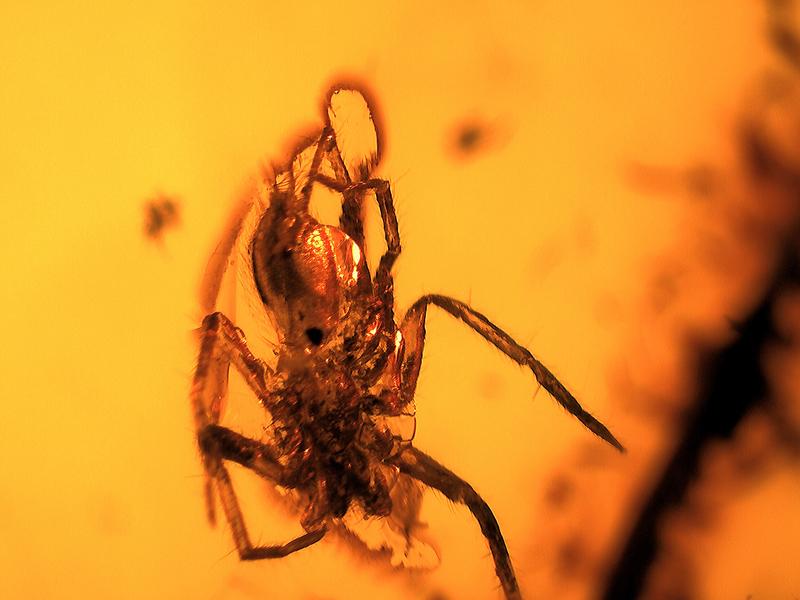 Nice spider near a fly, Diptera, Brachycera. The spider is not large. 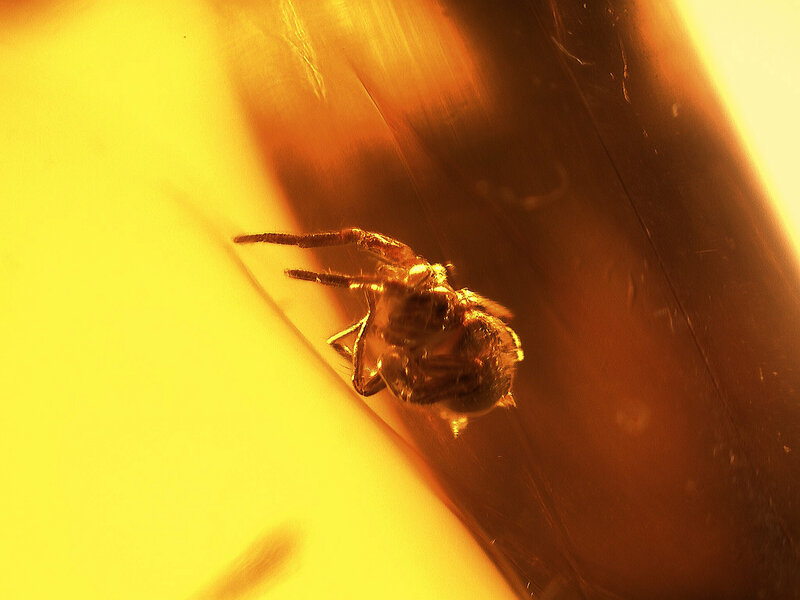 A small piece with a small spider. 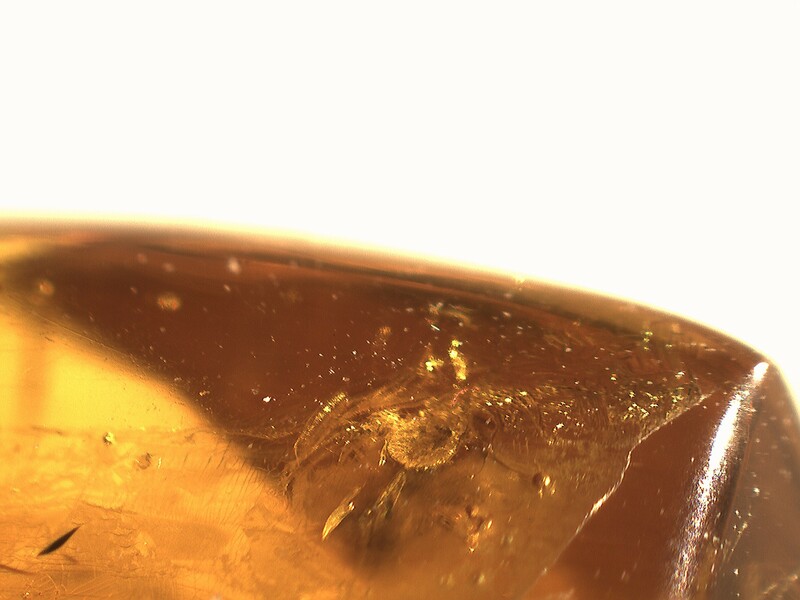 Magnification is needed with this gal. 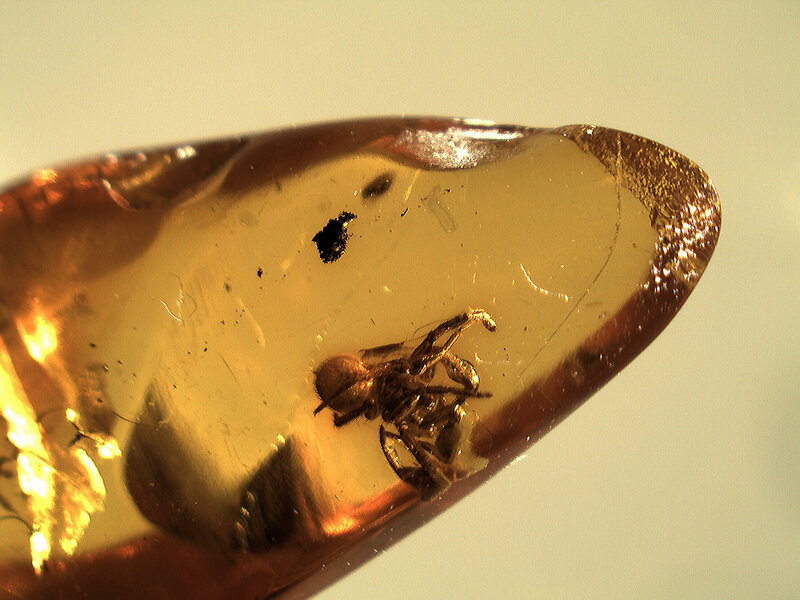 This would be the perfect piece since the spider is so nice, but the size is a determinant. 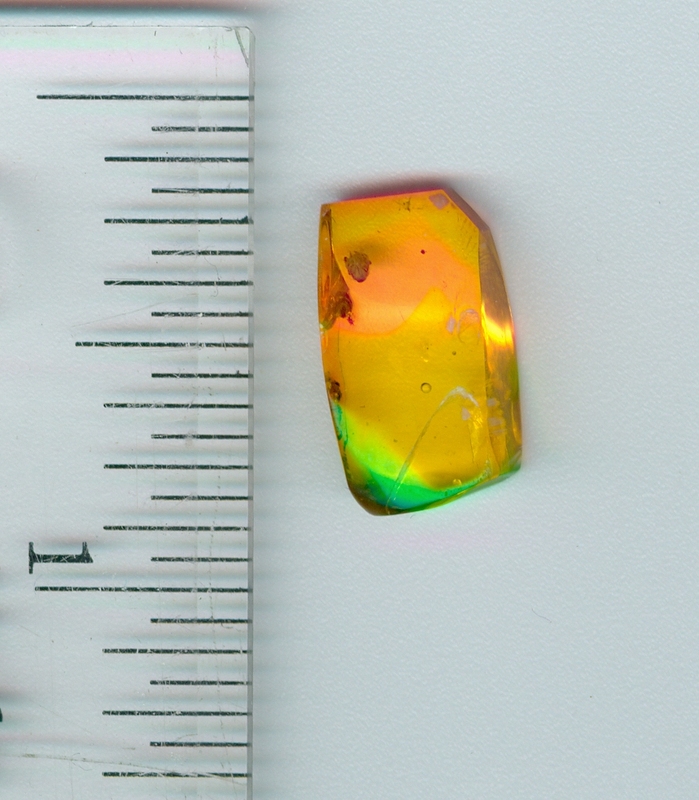 First of all, this is a small piece of amber. 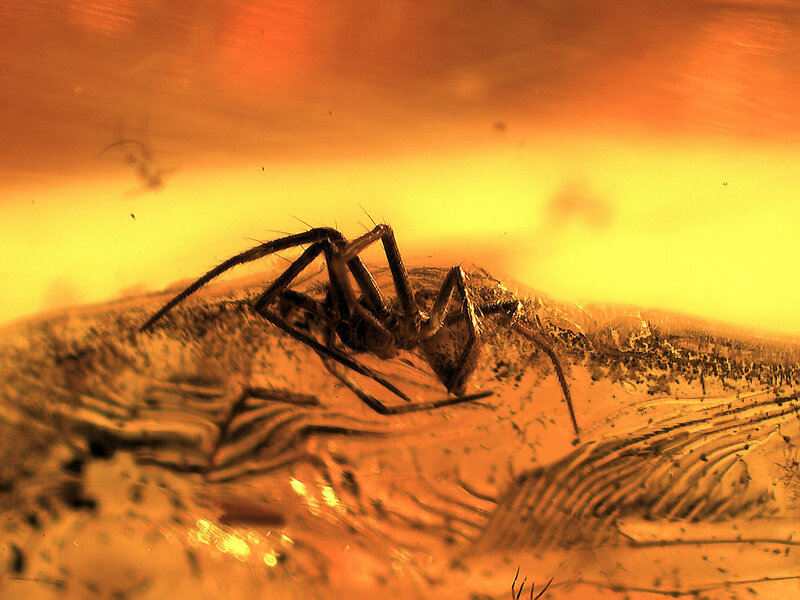 Do not buy this because you feel that you will have an easily seen 'spider' in a big piece. 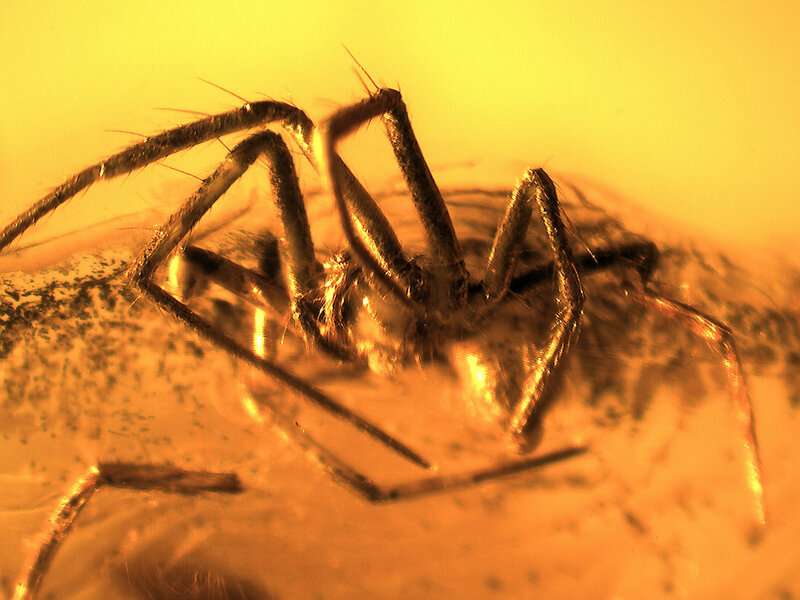 Actually this is not a spider, it is a daddy longlegs. 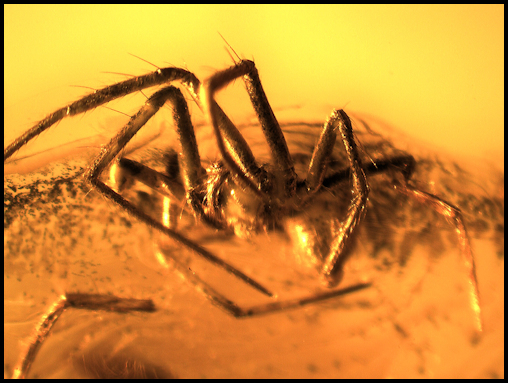 The term “daddy longlegs” most properly refers to an arachnid in the order Opiliones, which are also called harvestmen. 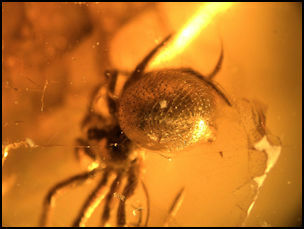 It is a fine specimen, does have a whitish cast to small portion of its body. 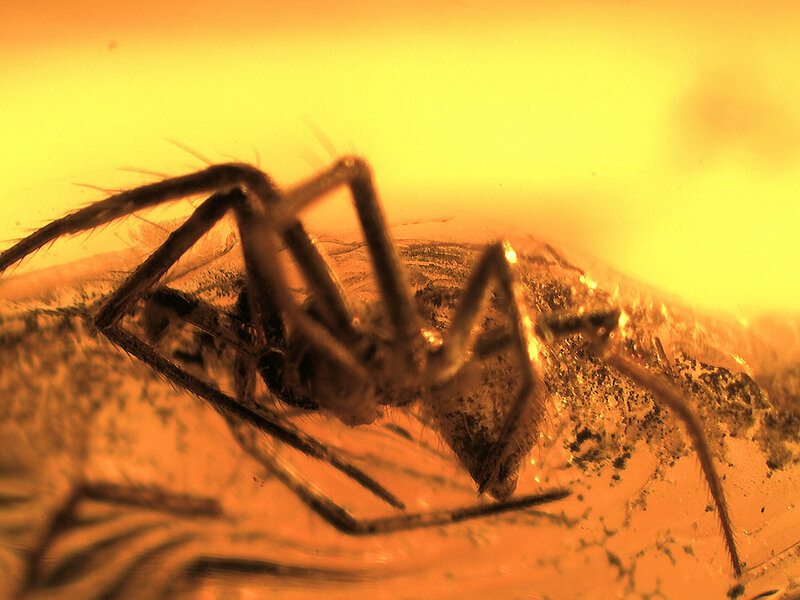 Now hang on, the interesting thing about this is that there are some strange 'bumps' on the abdomen. 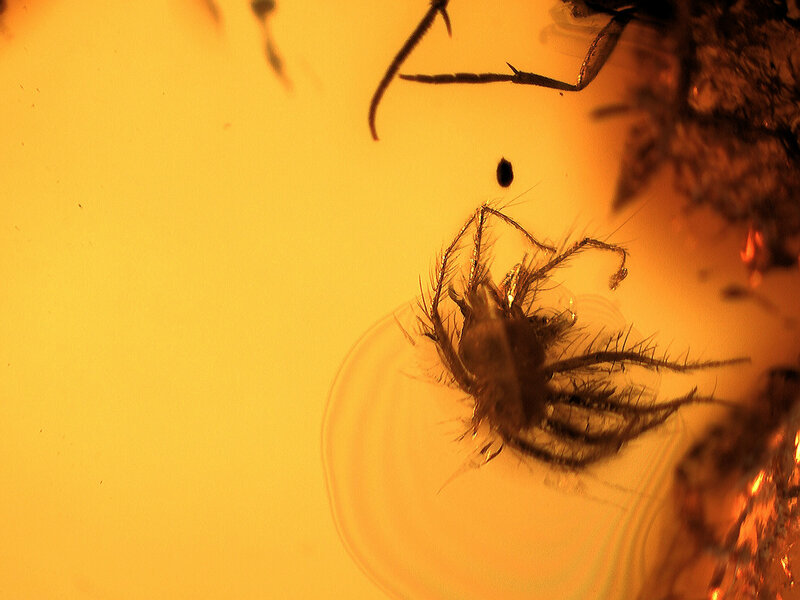 I will not say that these are 'baby' longlegs, but I would not discount it. 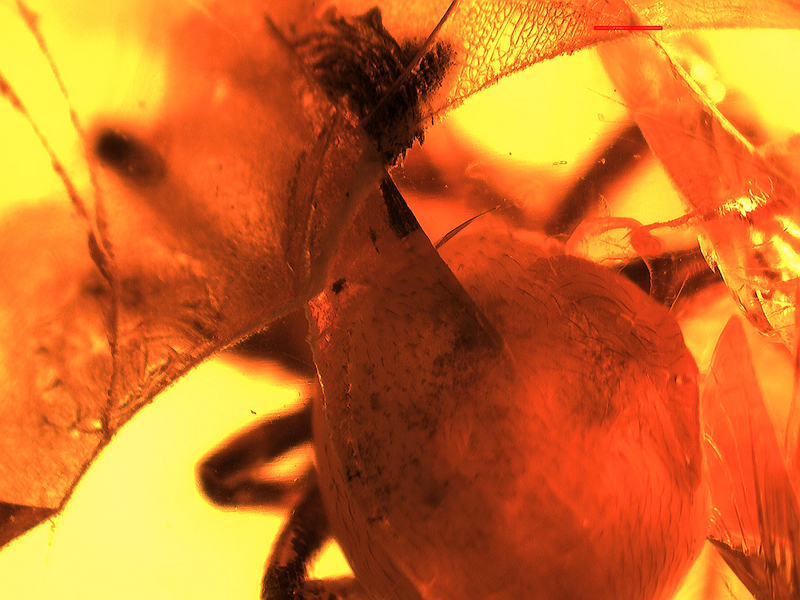 If you need a spider mite for your collection, here it is, Acarina, Orbitidae. 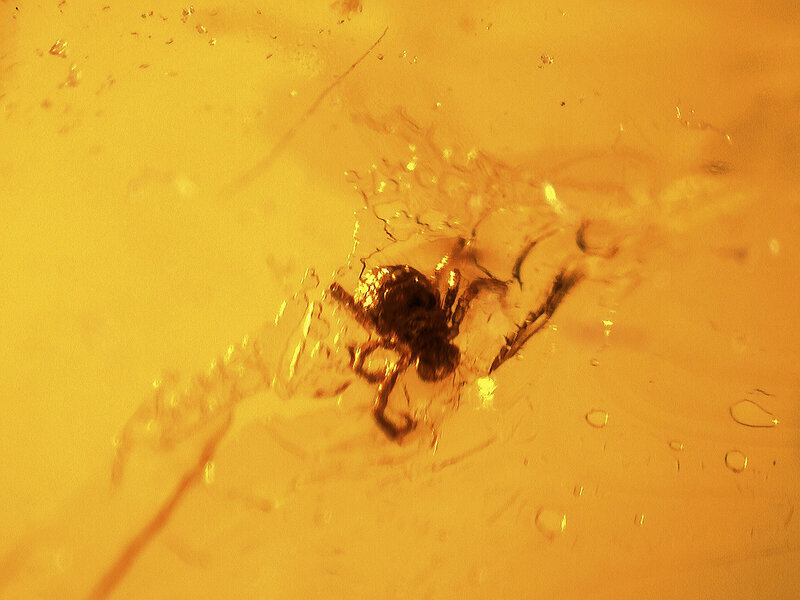 Spider mites are small and the amber is small also. 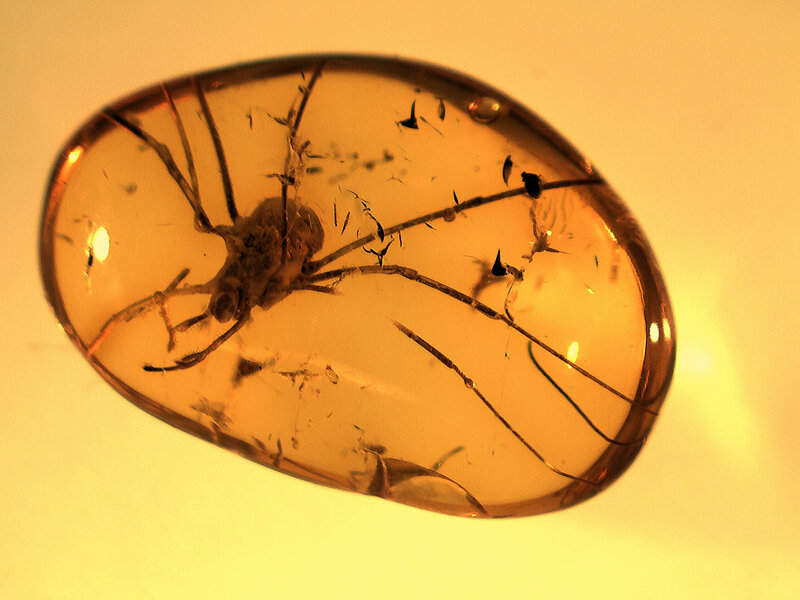 Good piece of amber that has a small spider. 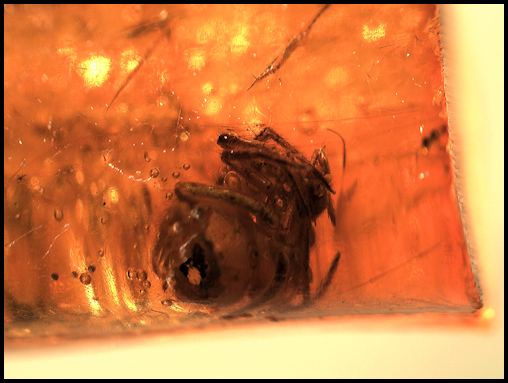 Small clear piece with a small female spider, Araneae, Oonopidae. 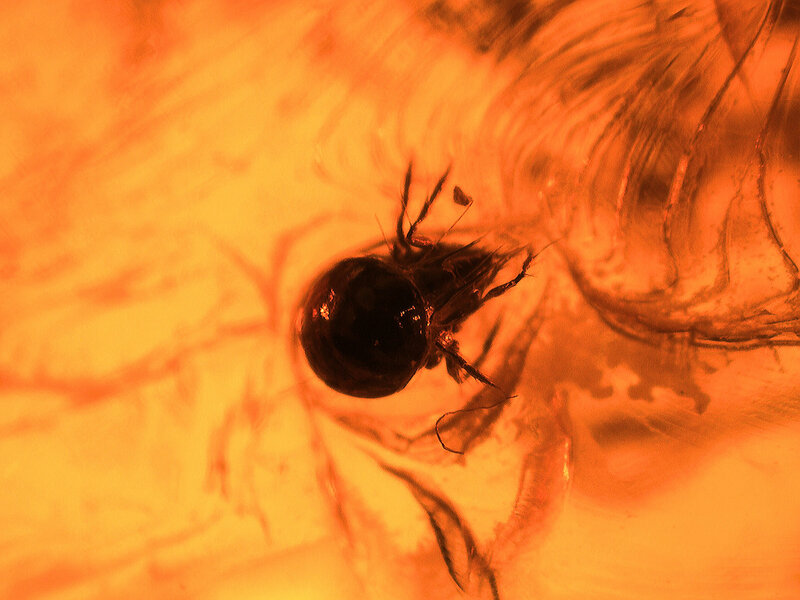 This contains a small spider and 2 long legged flies, Diptera, Dolichopodidae. The flies are hard to see, but have good detail. 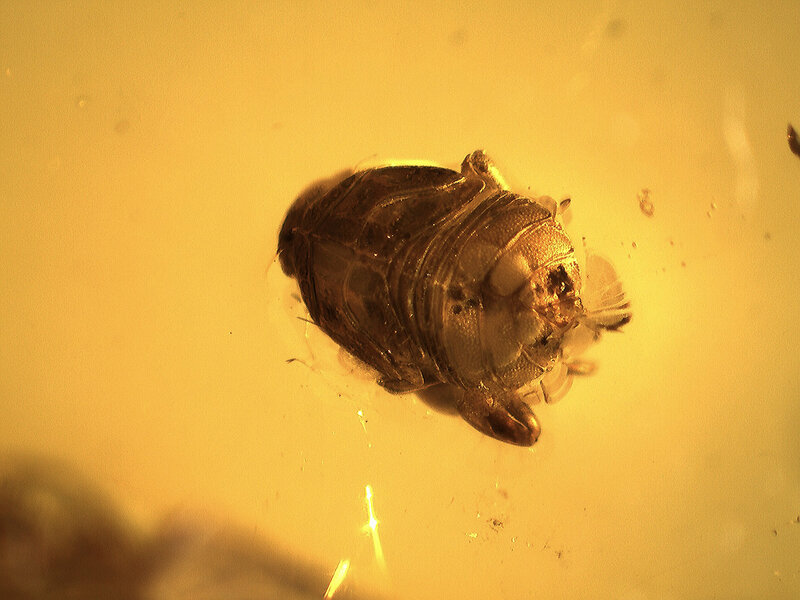 Here is a Baltic mite. 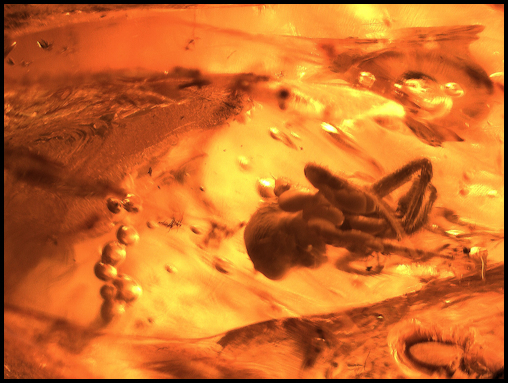 Mites are small, but they can have fascinating detail, like this one. 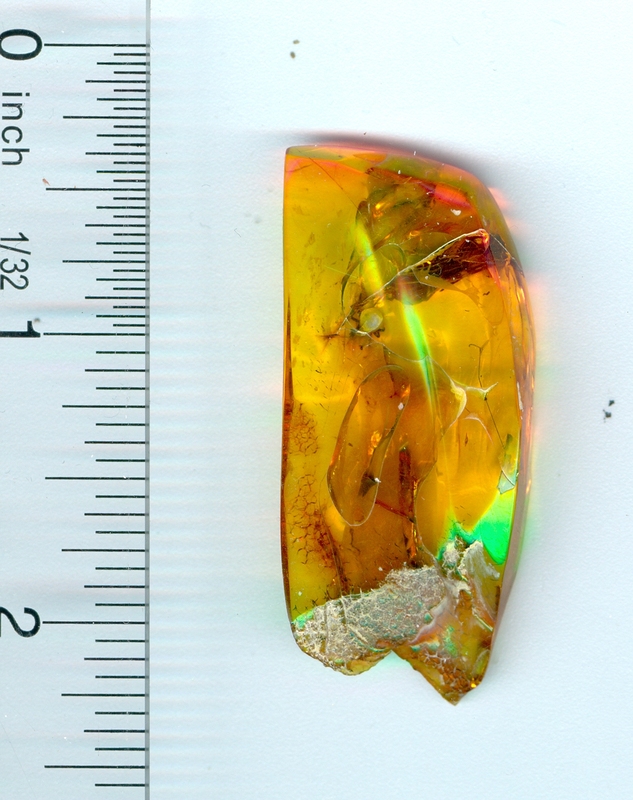 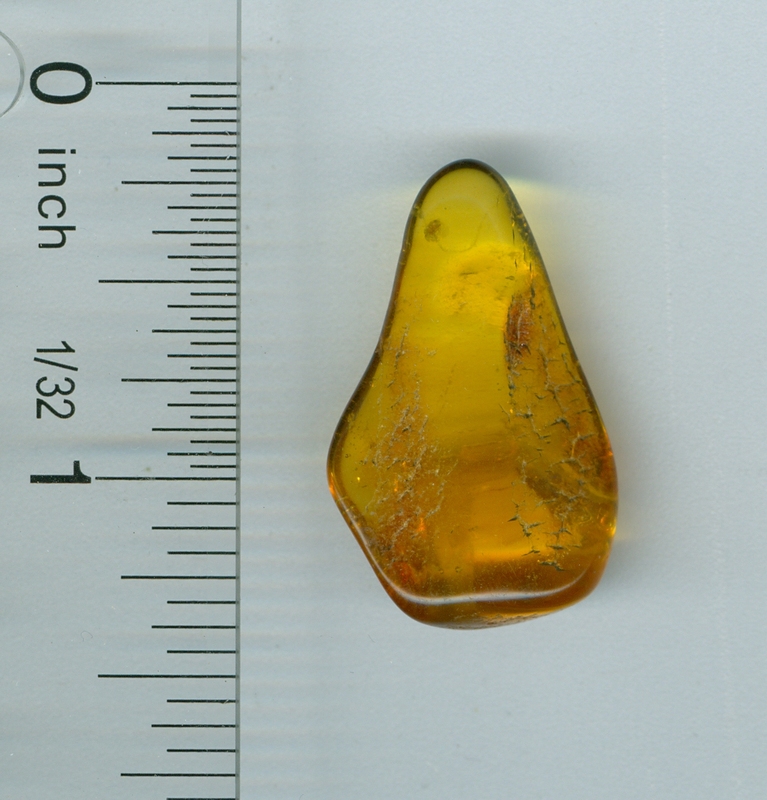 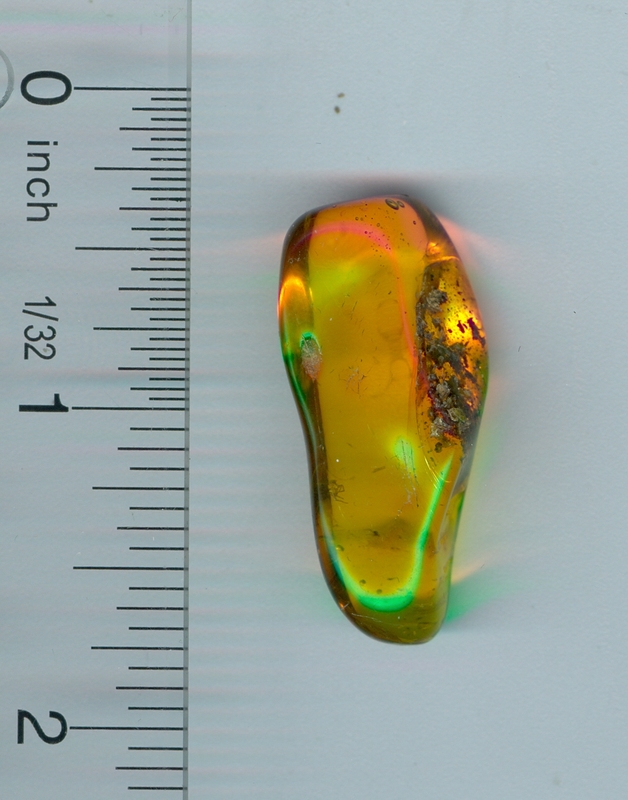 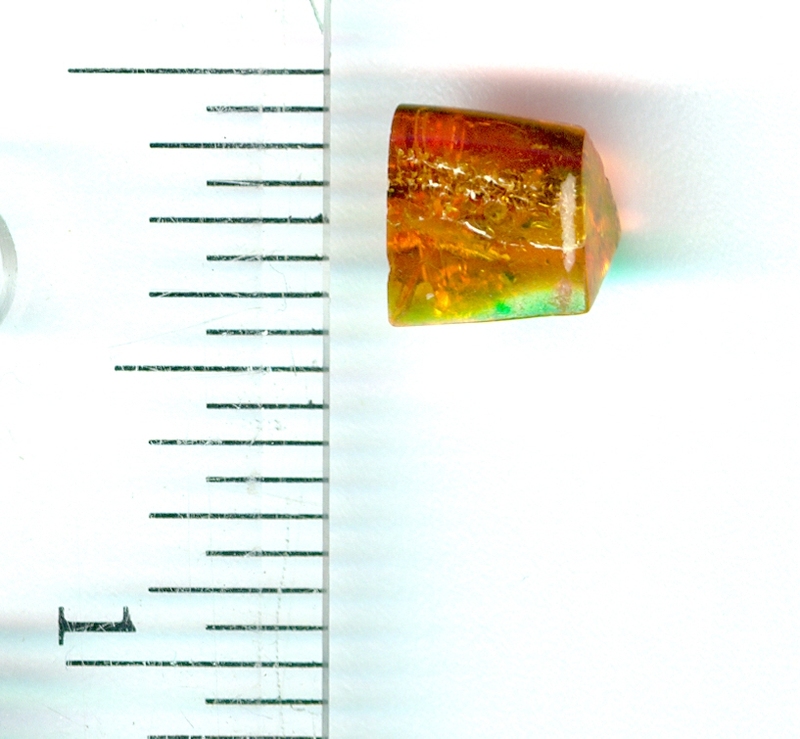 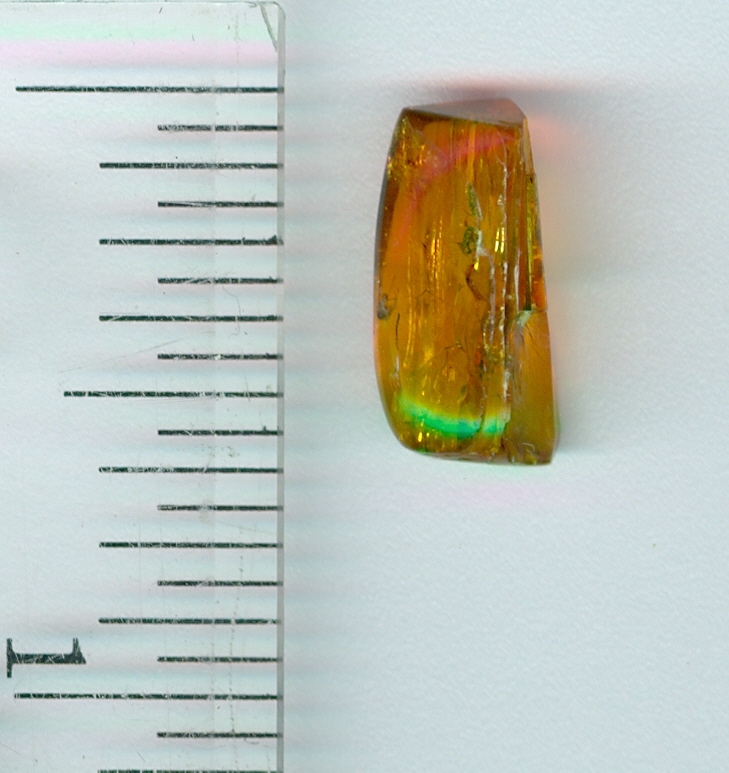 An irregular shaped piece of Baltic amber. 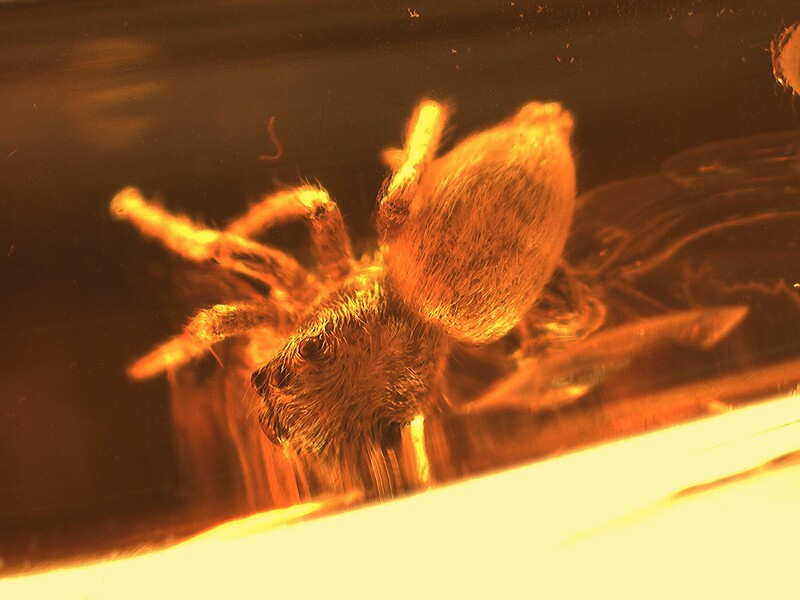 It does have a very nice (and small) spider on one edge. 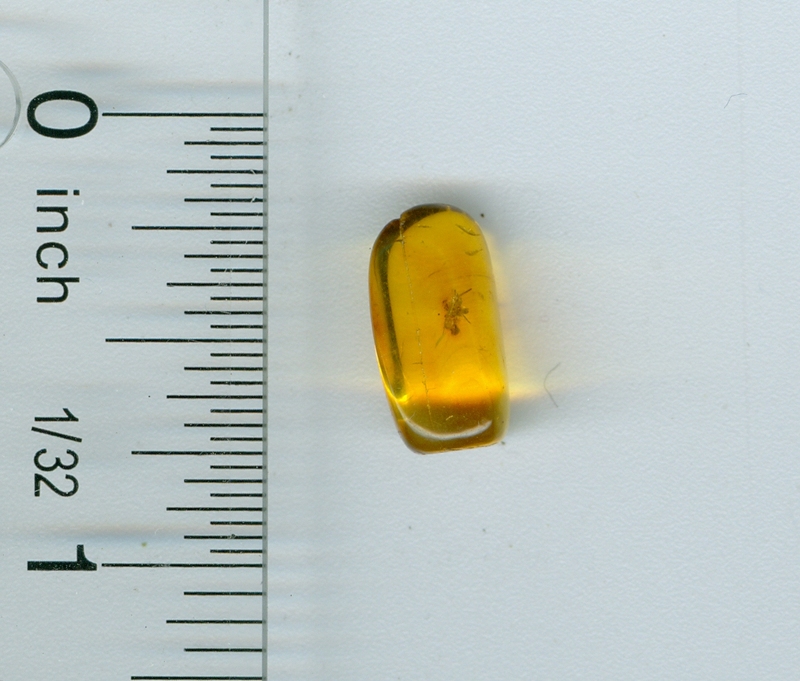 There was also a springtail at one time (at another time when I was looking), I just cannot find it now. 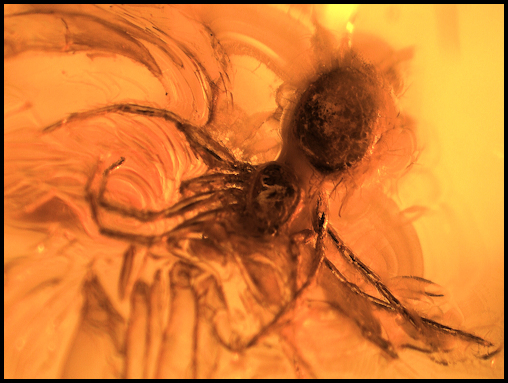 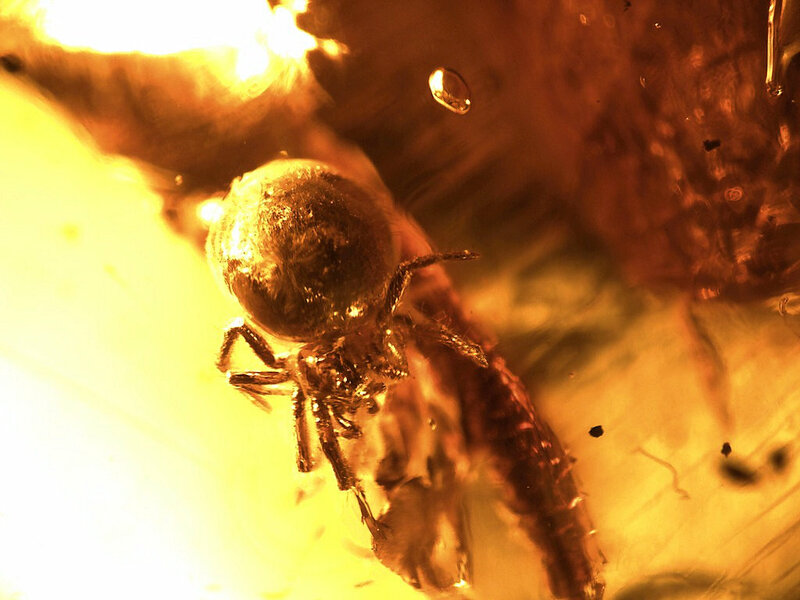 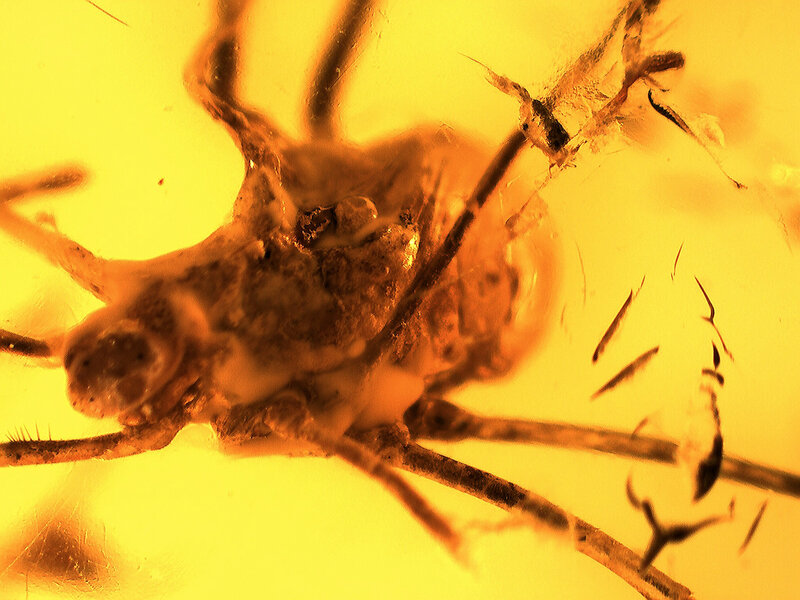 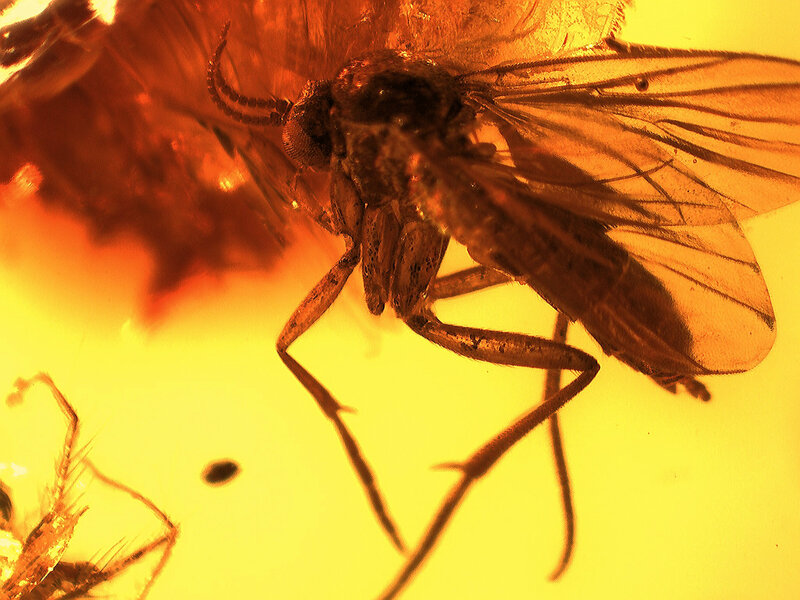 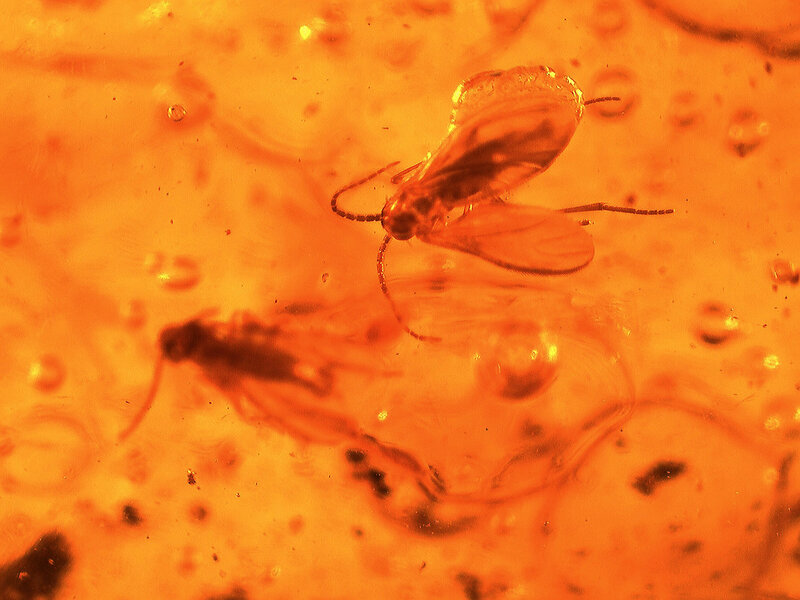 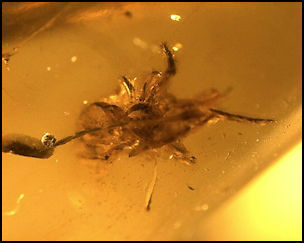 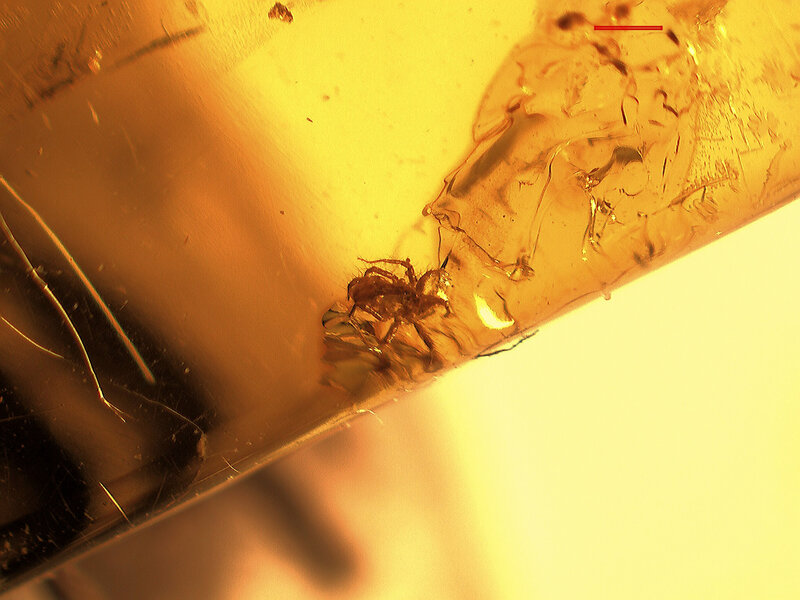 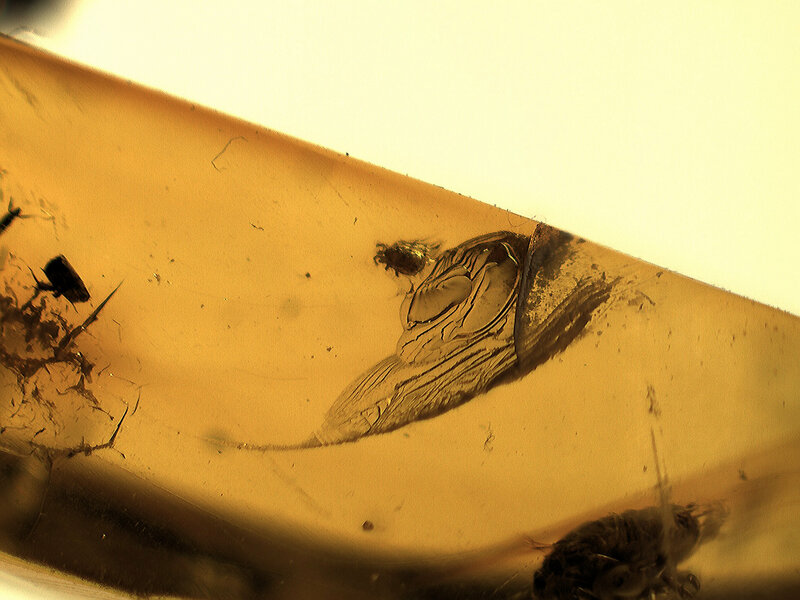 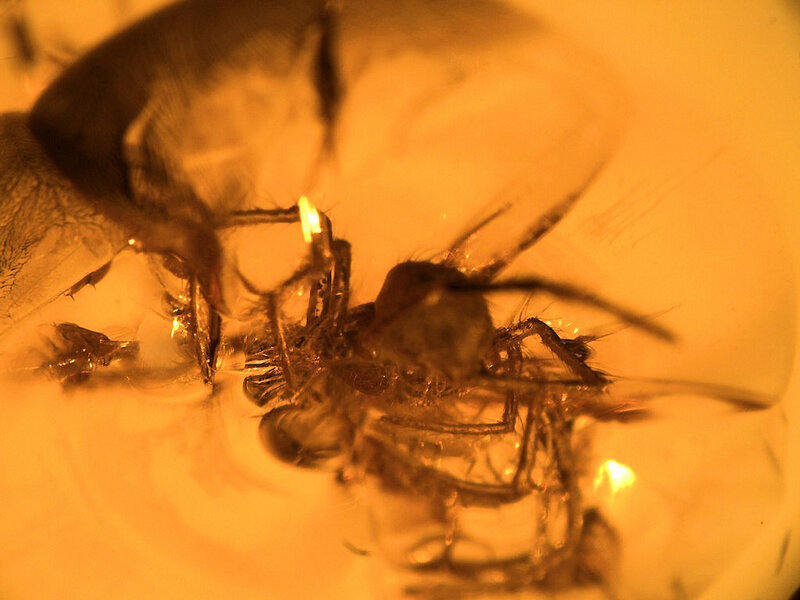 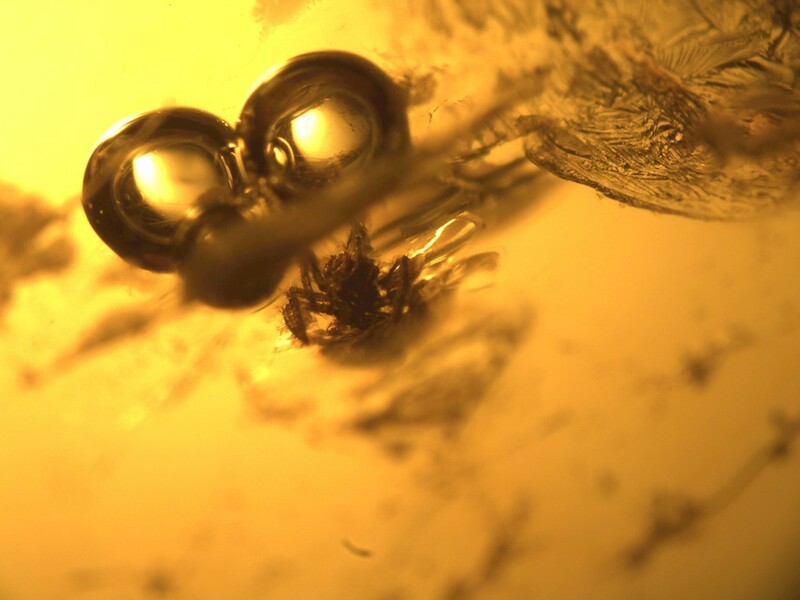 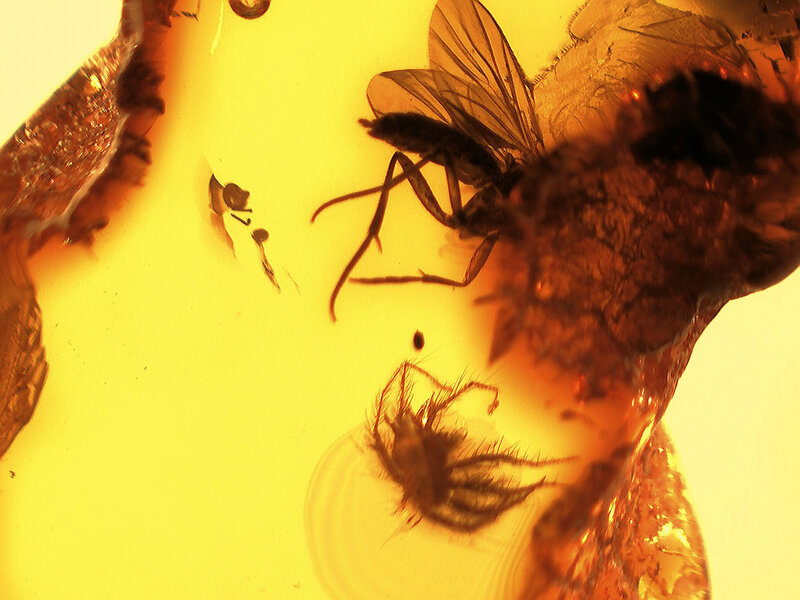 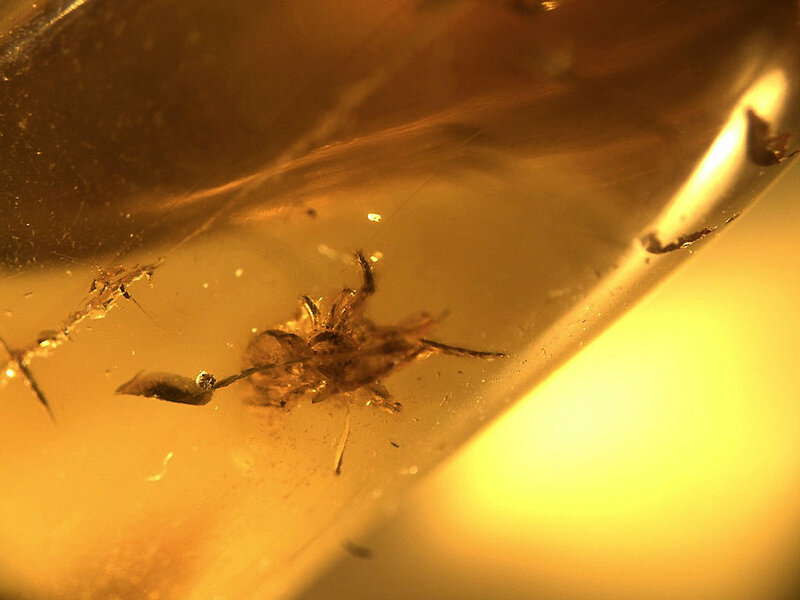 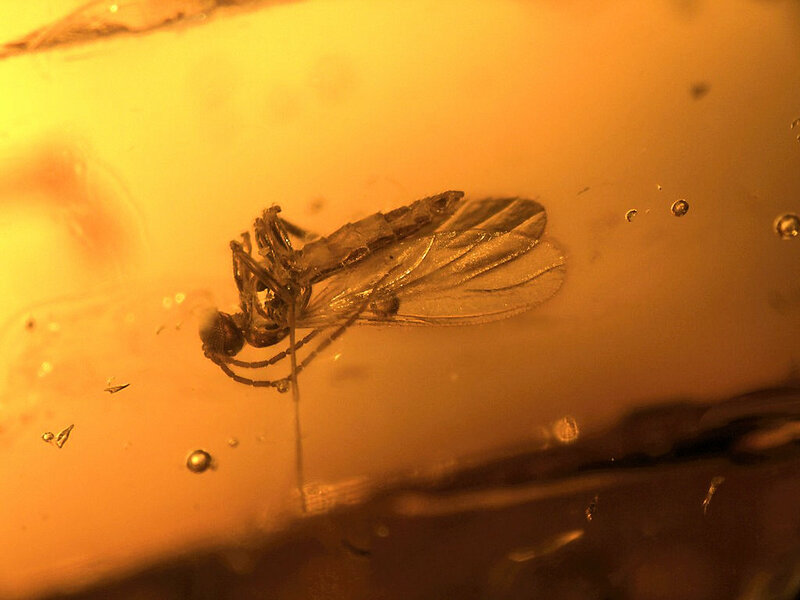 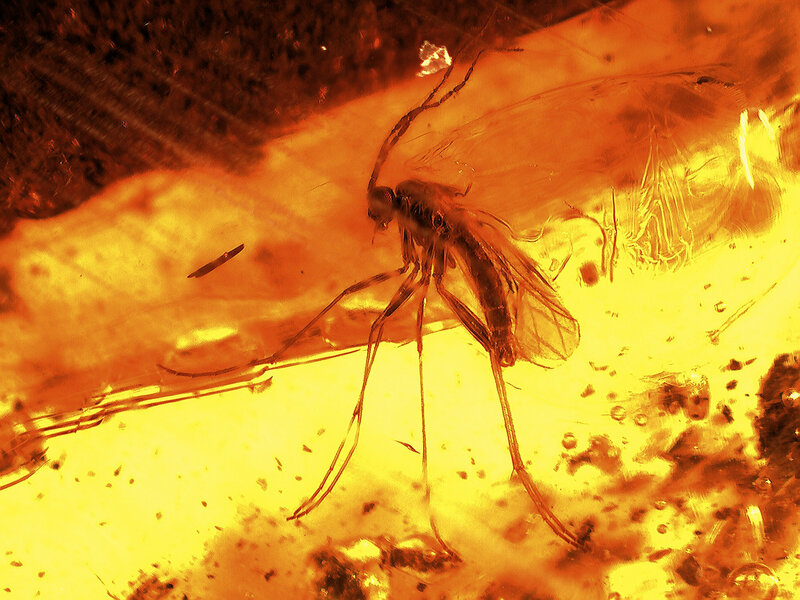 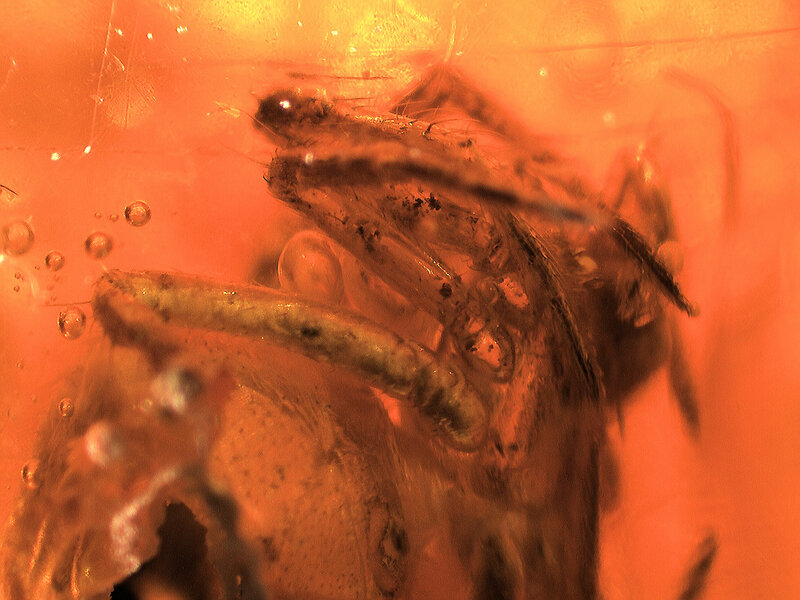 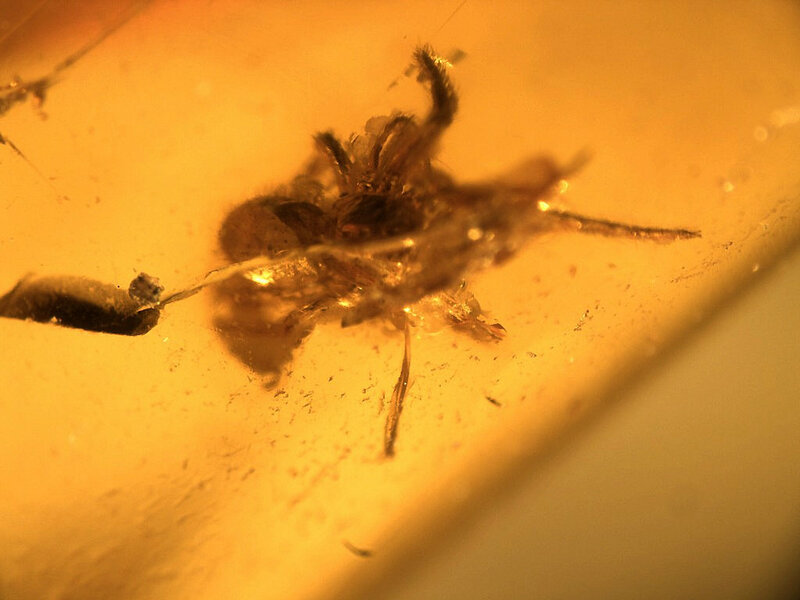 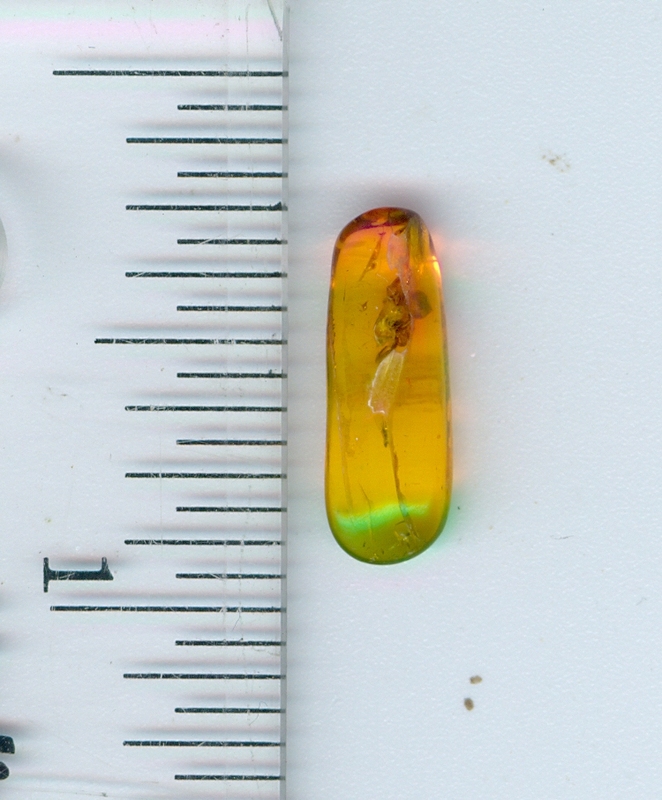 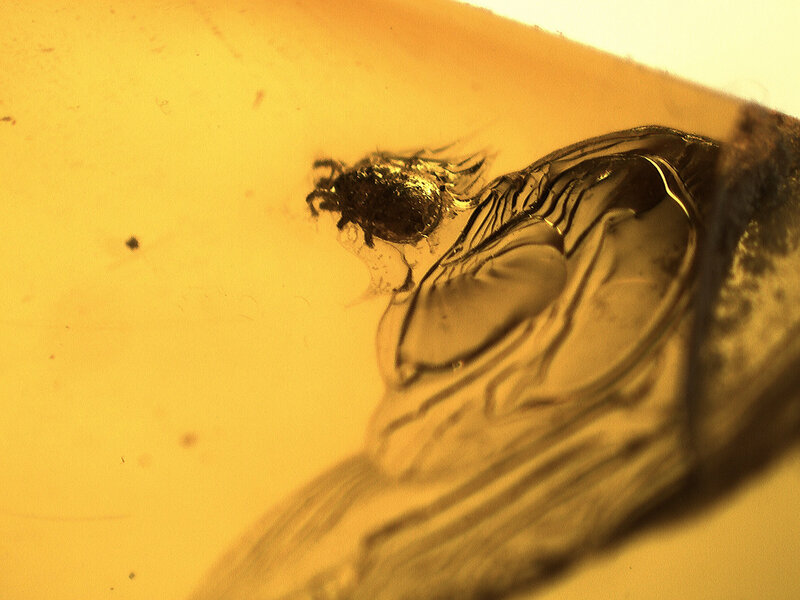 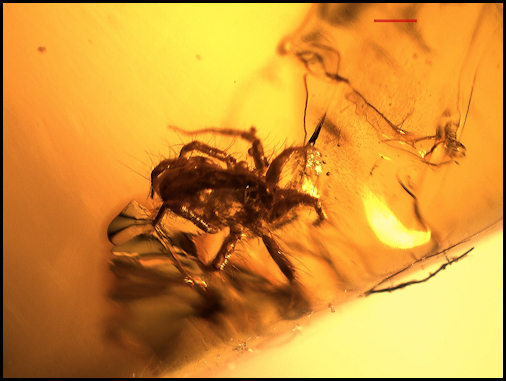 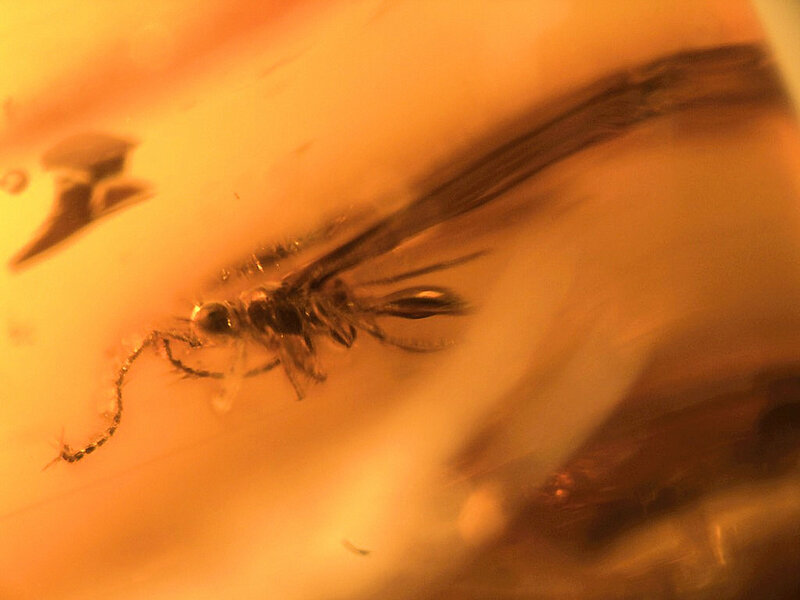 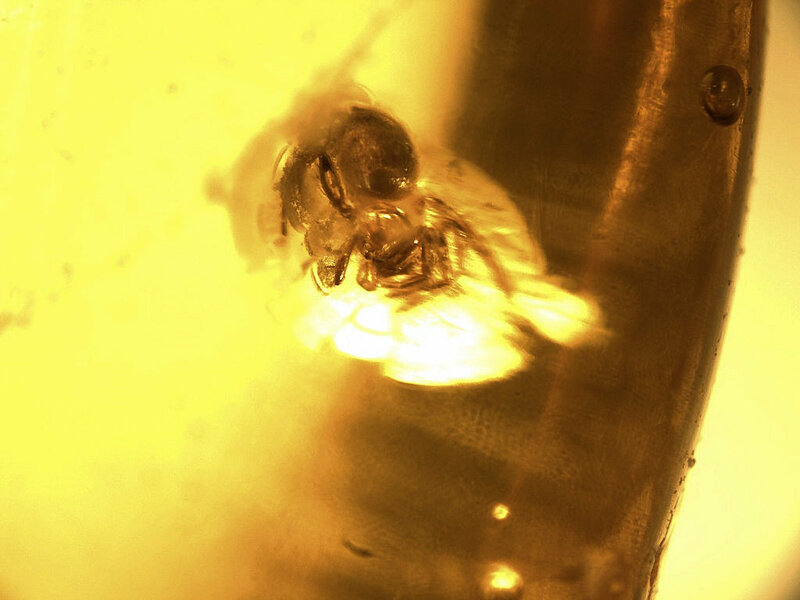 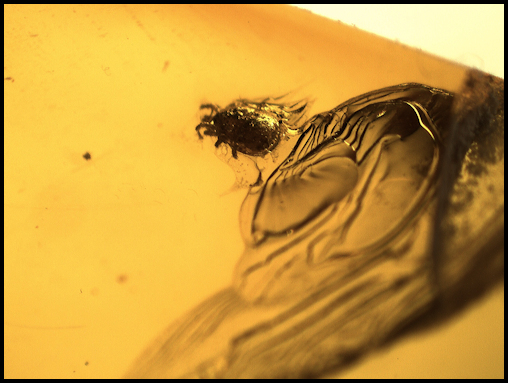 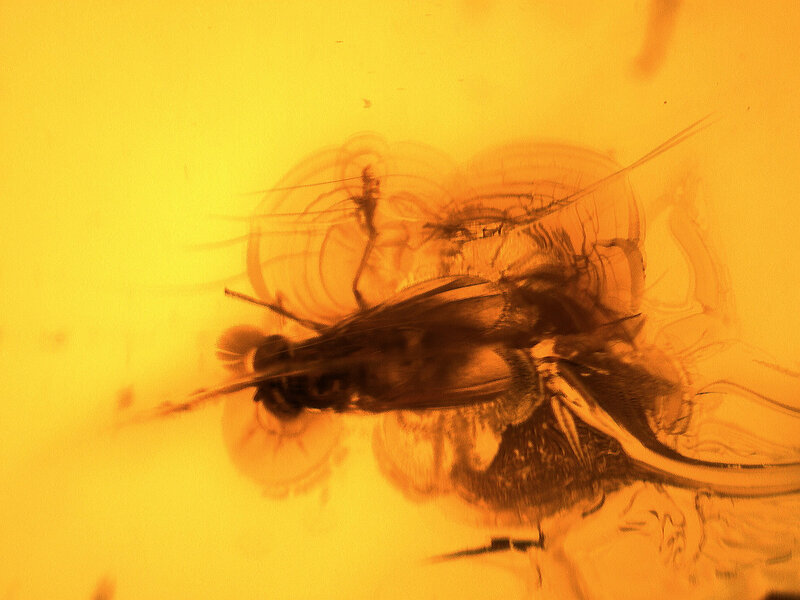 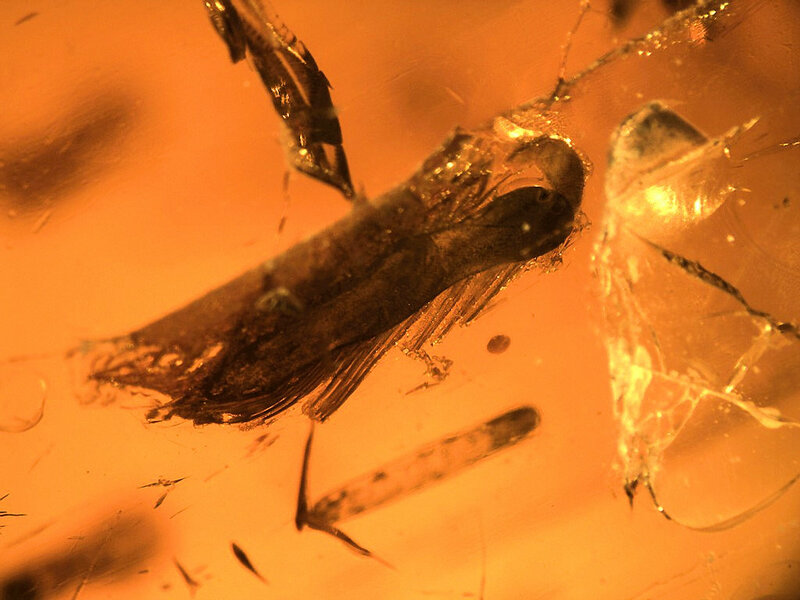 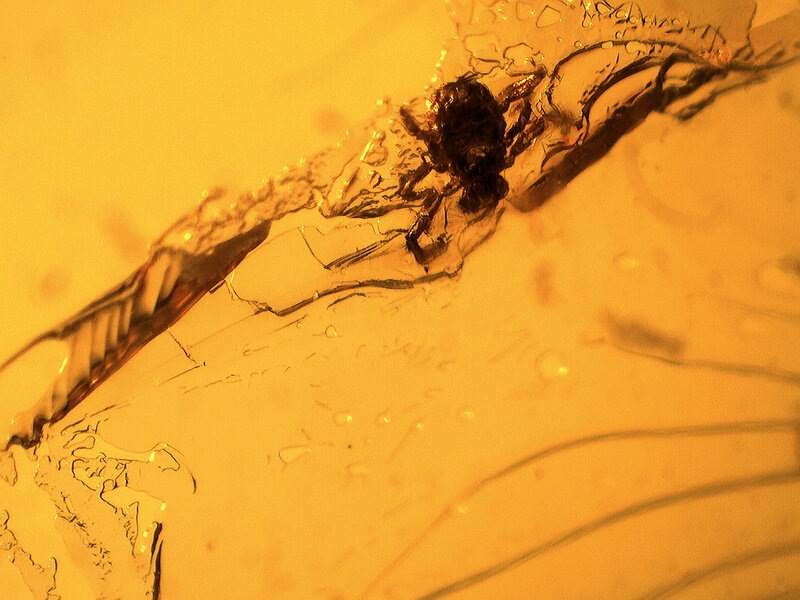 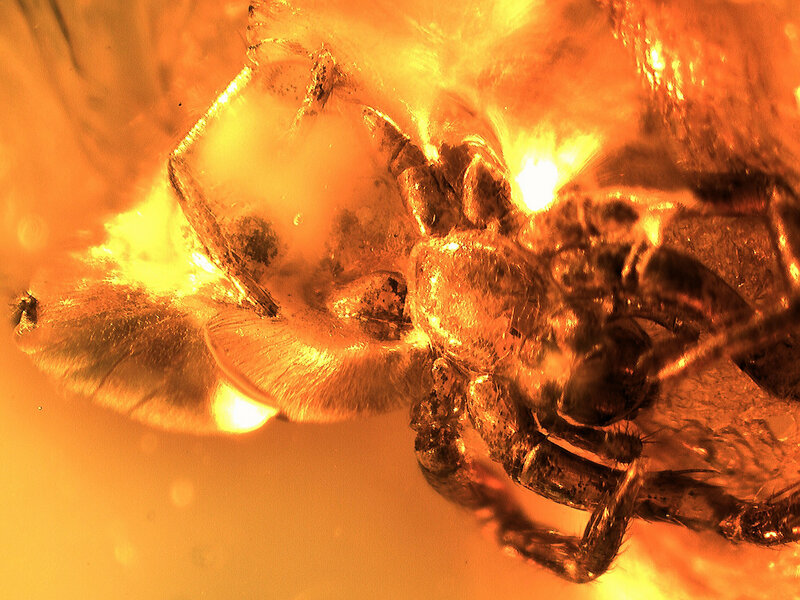 Clear piece of amber with a predatory mite, Acarina, Parasitidae. 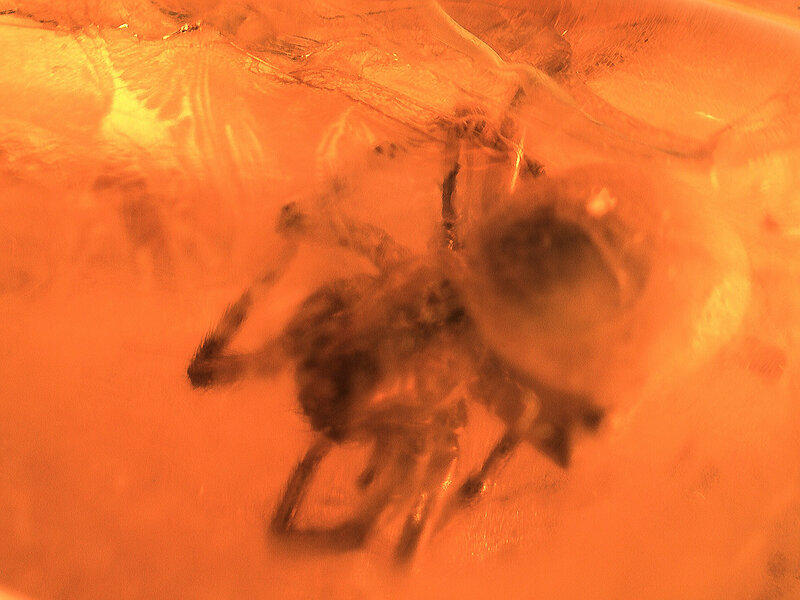 There is also a small wasp, Hymenoptera. Nice small spider (photographs well) in the family Salticidae. 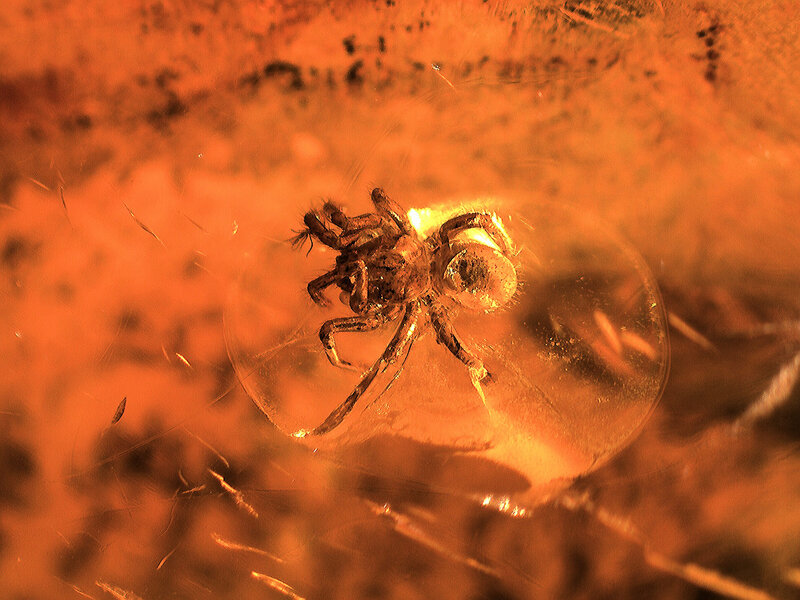 this is a jumping spider. 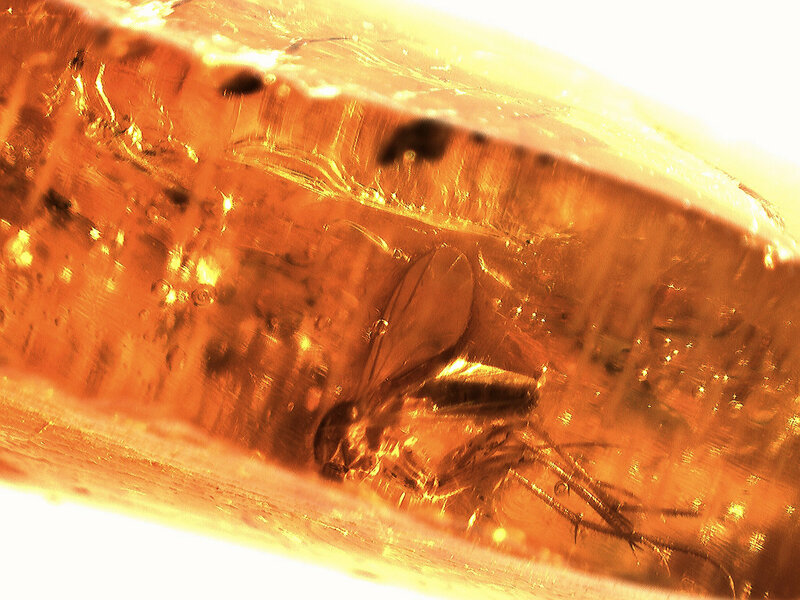 A small piece of amber. 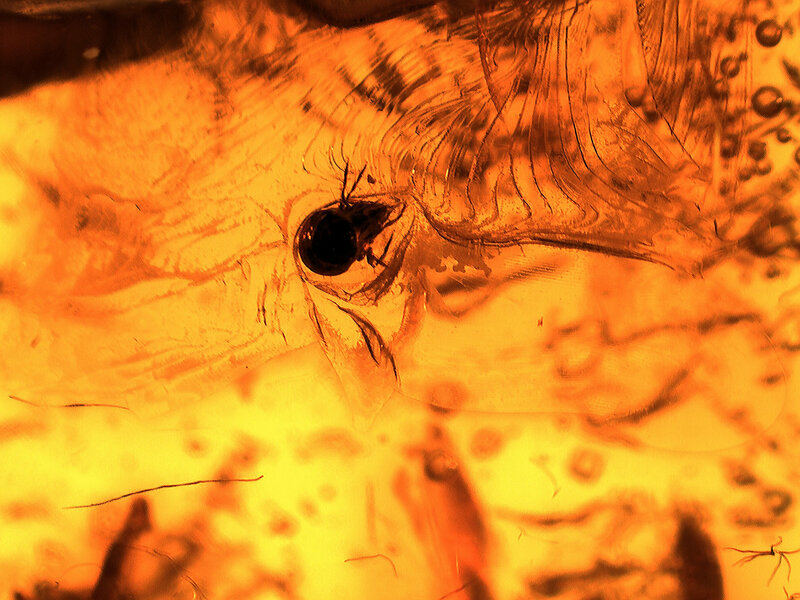 I am not sure why I think this is so cool - maybe the pictures will show you why. 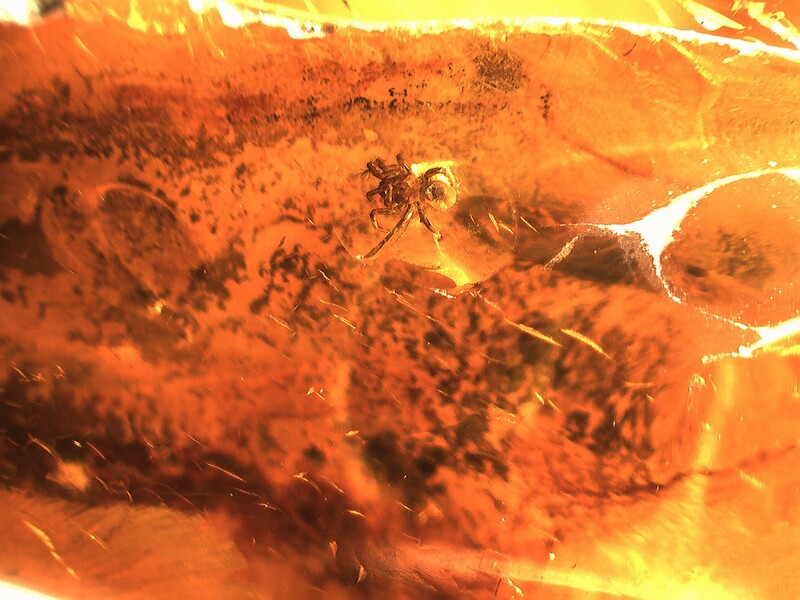 The spider is not easily seen. 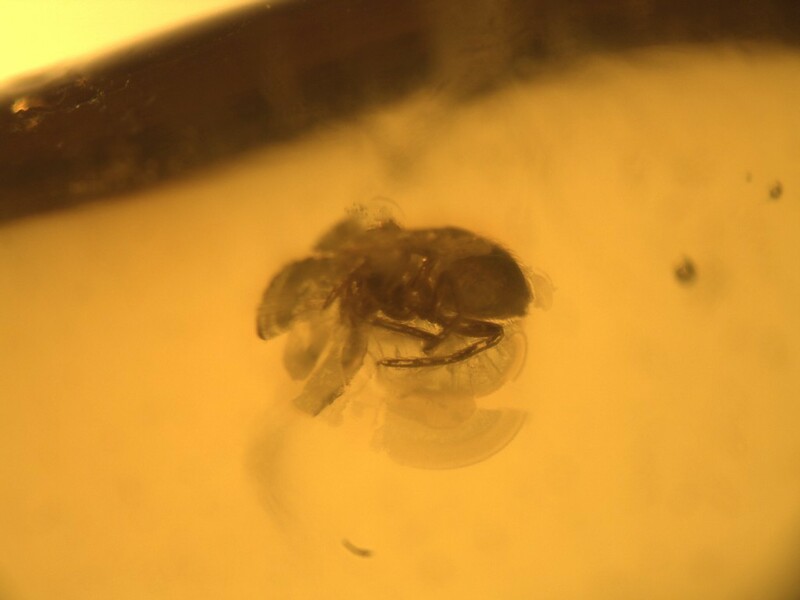 Large parasitic mite, Acarina, Parasitidae. 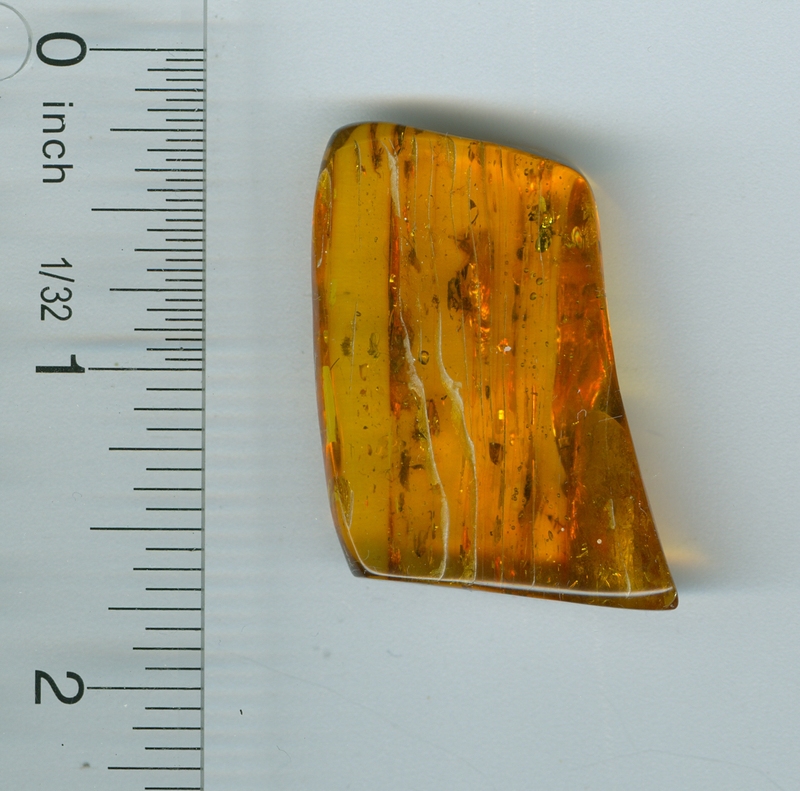 The amber is fun, very polished, wavy, nice. 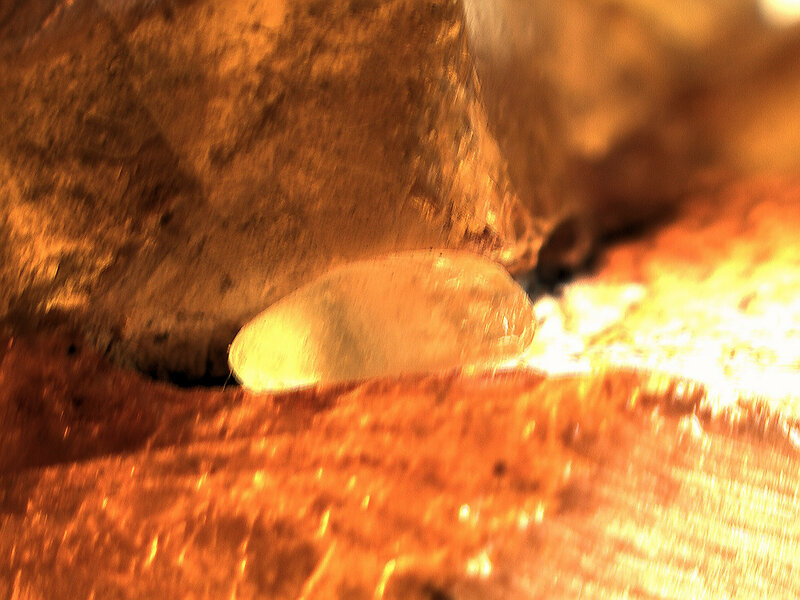 Good mite in a small piece of amber. 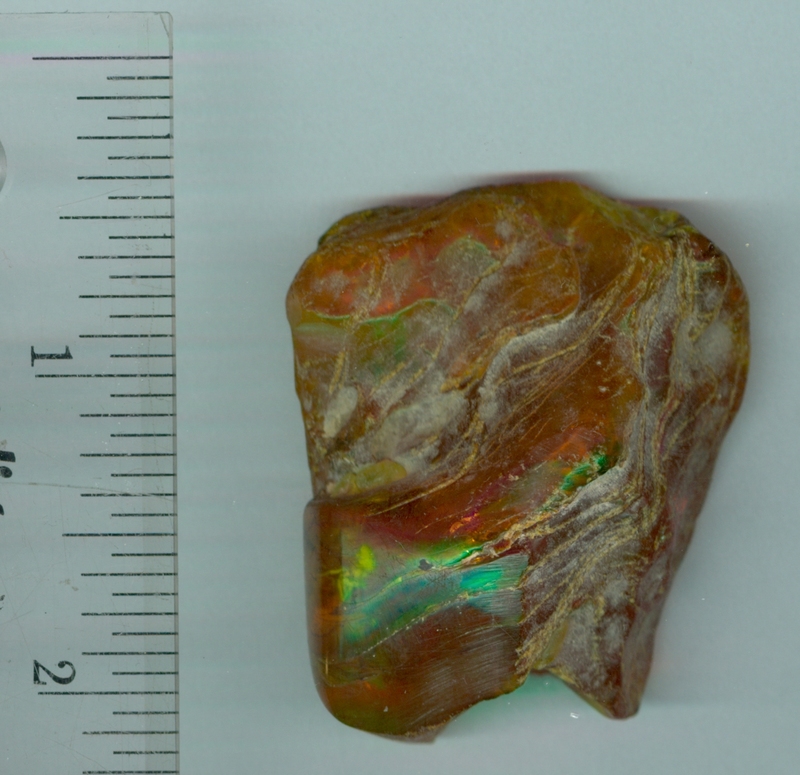 Better price offsets the size. 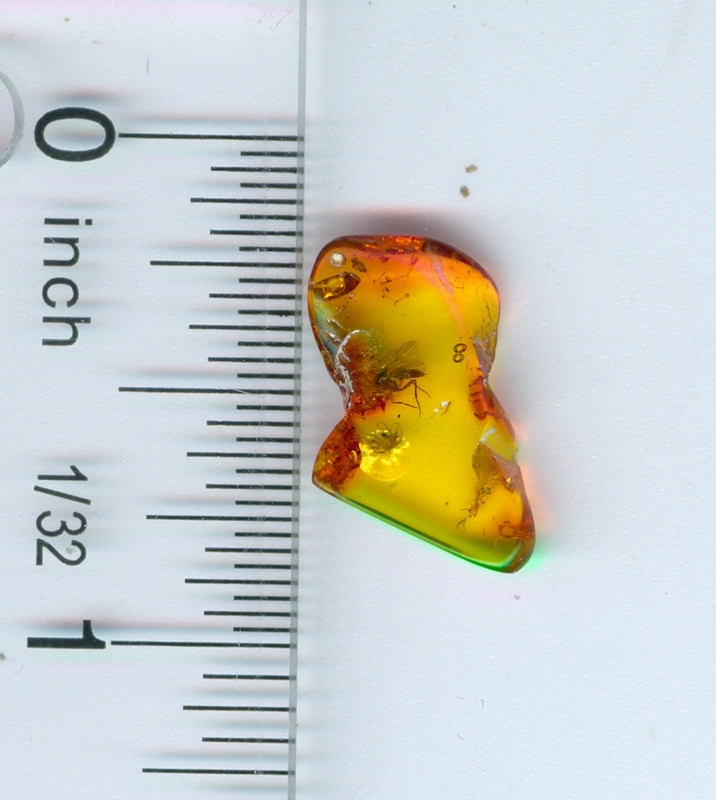 I will loosely call this a jelly bean sized and shape piece of amber. 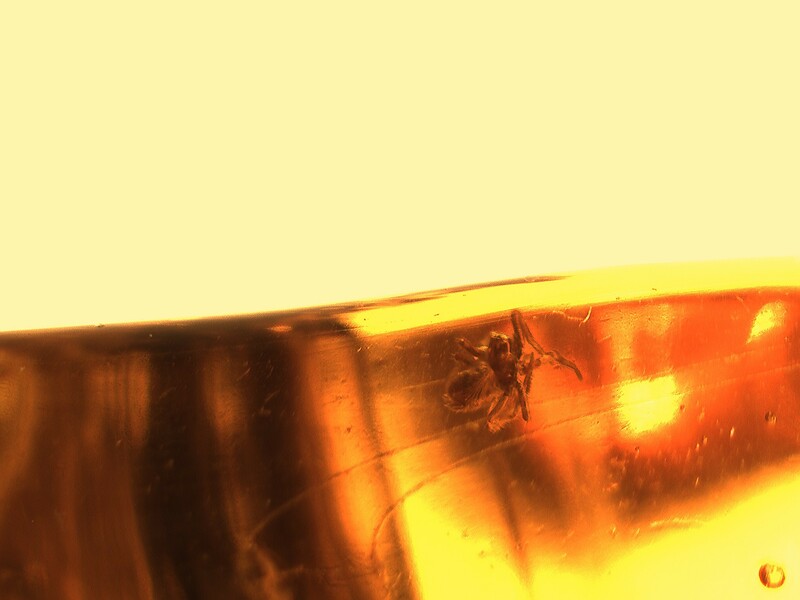 Smallish, but good, spider near the edge. 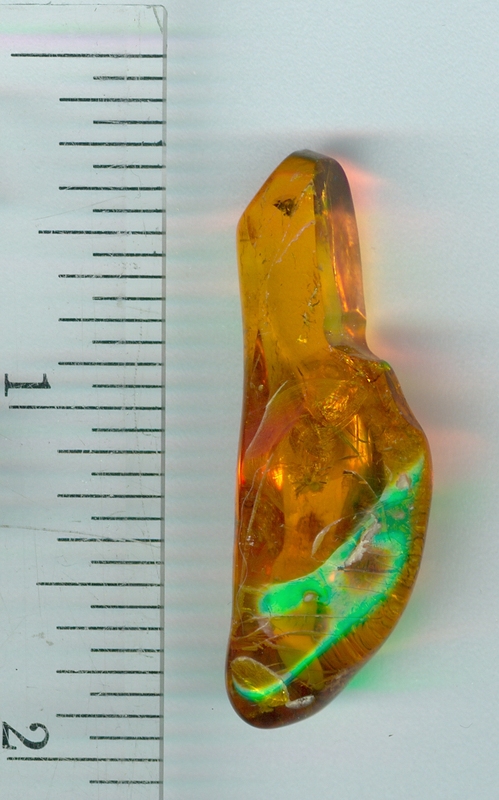 A lot of stuff inside this piece. 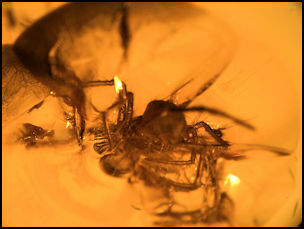 1 spider, an Opiliones (harvestman) and it looks like 5 beetles, Coleoptera.